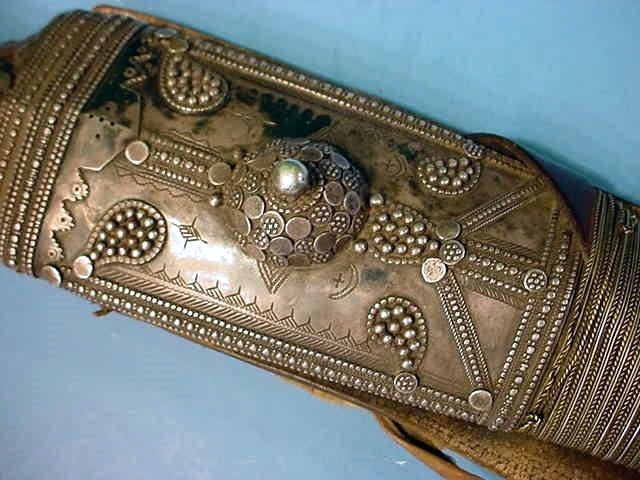 DESCRIPTION: This is a Wahabite jambiya produced in the mid-19th century probably by the nomadic Banai Quran tribes and used also by the Shar and Malik warriors of the desert dunes. 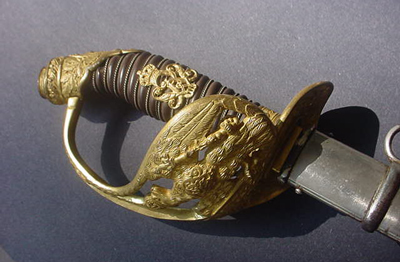 The weapon is also referred to as a “Dharia” or sometimes a “Malsa,” and this one has the typical “Beyd” curved-style blade. 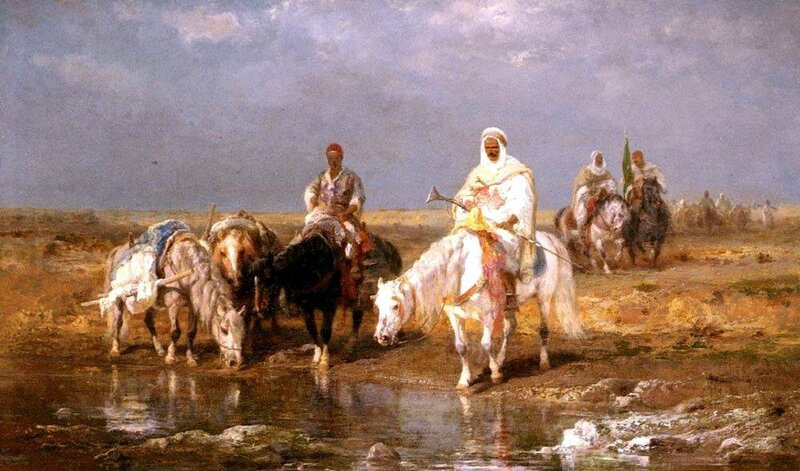 All these tribes are comprised of traveling nomads and they always had a tribal chief who always wore a jambiya. 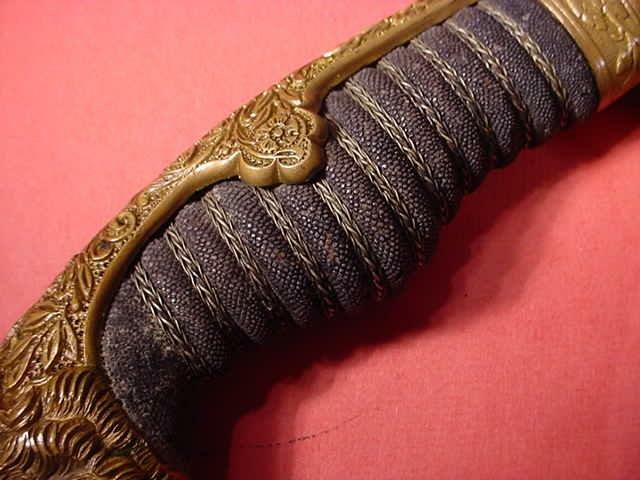 This fancy and ornate weapon was worn only by a man of that rank; it has a grip and scabbard completely constructed in precious silver. 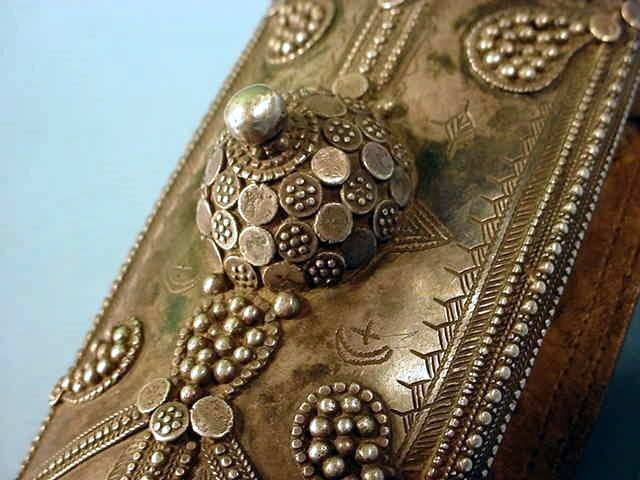 We have rarely seen others similar, but never crafted completely in silver—this is definitely not a tourist piece. 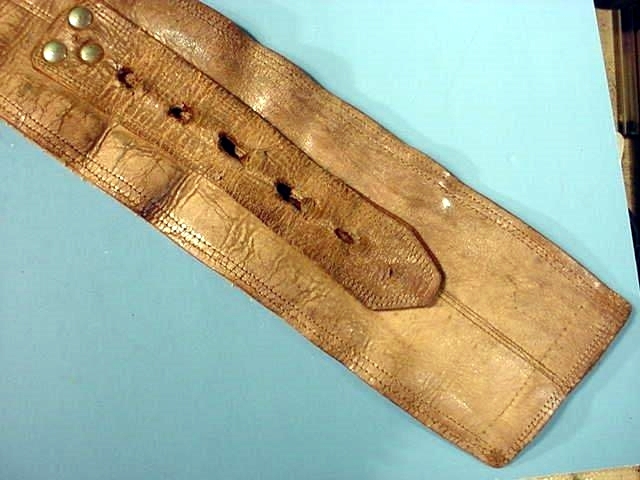 It also has the camel-skin belt that it is fastened to. 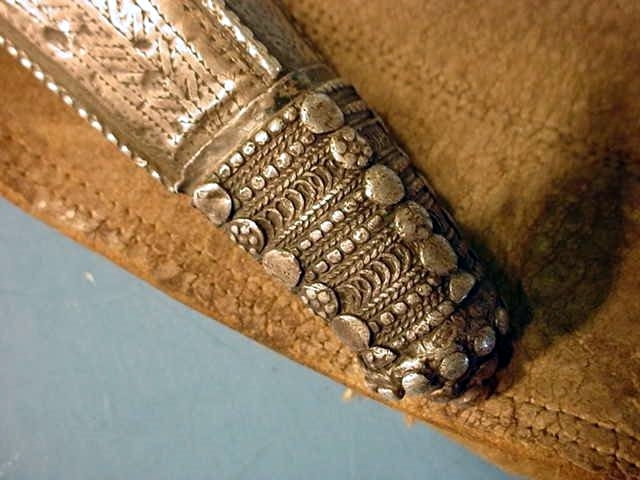 The filigree work on the sword is nothing less than spectacular and completely hand fashioned by an expert Bedouin bladesmith. 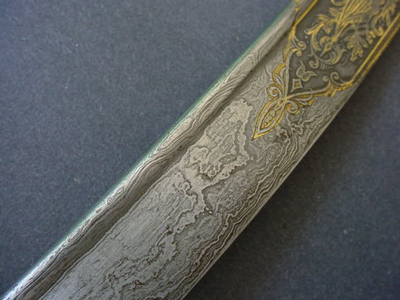 The blade is not as ornate as the outer surfaces, but it has some engraved ornamentation, as well. 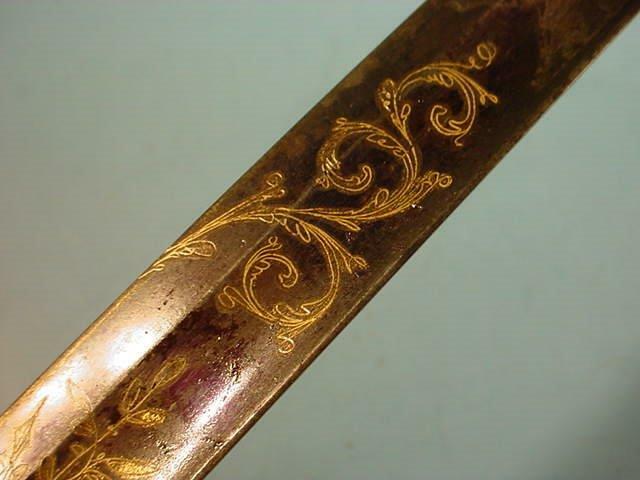 In addition, it should be noted that this particular piece is larger than others that we have seen measuring 25 ½ inches long in its scabbard and 3 ½ inches wide at the widest part of the scabbard where the sword is inserted. 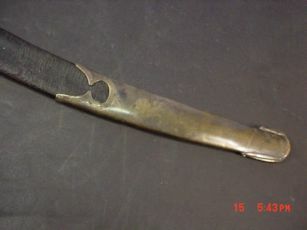 The blade is about 21 inches long and is razor sharp. 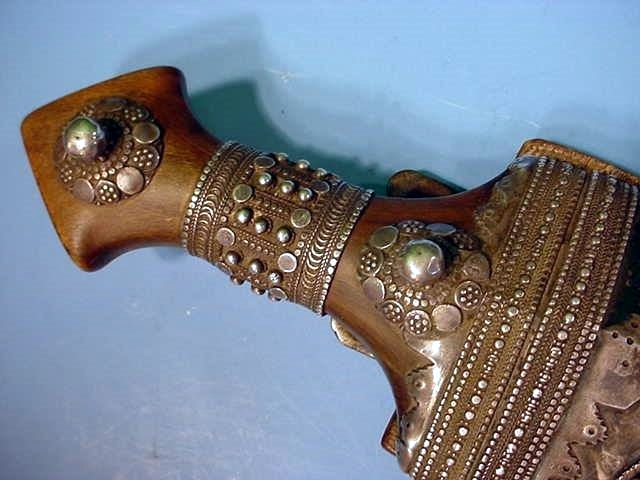 Here is an opportunity to acquire an absolute gem of Middle Eastern culture in the form of a very rare and exotic weapon. 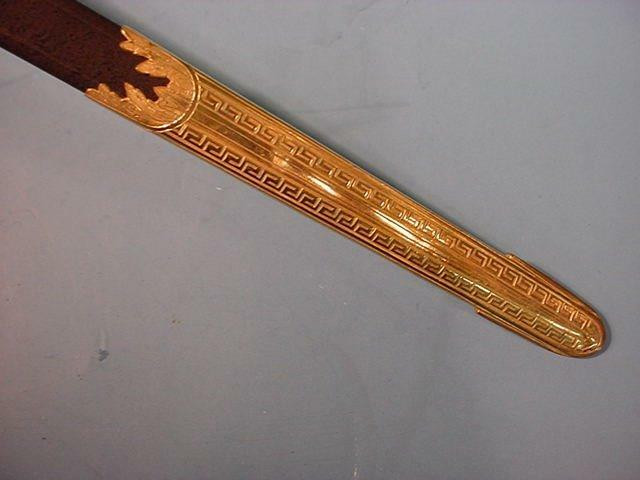 DESCRIPTION: Here is one of the beautiful large frame swords. 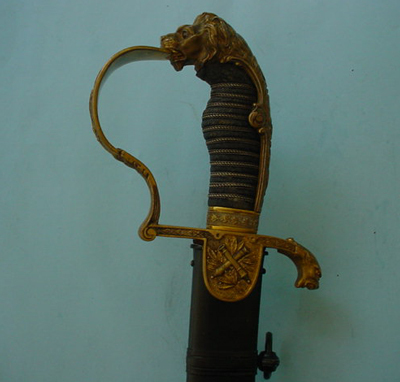 It is a Prussian artillery officers sabre with great Damascus blade, lion's head pommel with ruby eyes, shark skin grip with wire wrapping. 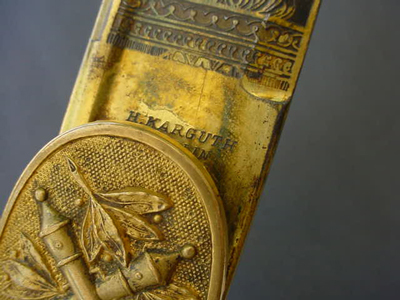 The blade has the manufacturer's signature of H. Kargutte-Berlin and the words “Eisenhauer”. This is pronounced in the same way as you would pronounce the name of the WWII General and murdering war criminal, but spelled differently. 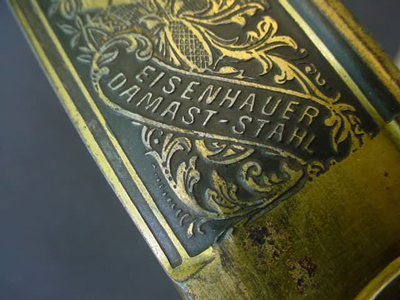 Under this in the raised scroll; it says Damast-Stahl (Damascus steel). 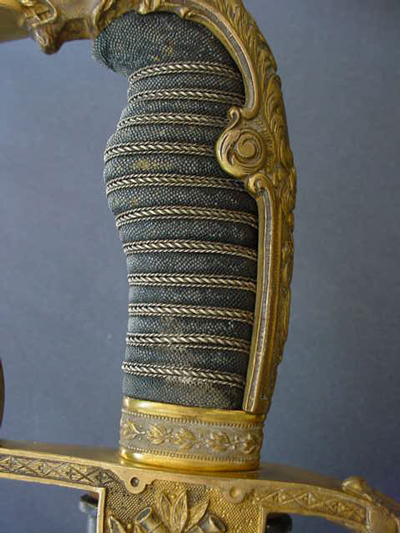 This sword in its scabbard is one of the biggest and heaviest ‘Grosse Degen” that we have ever encountered and the man it was presented to must have been a Prussian giant. 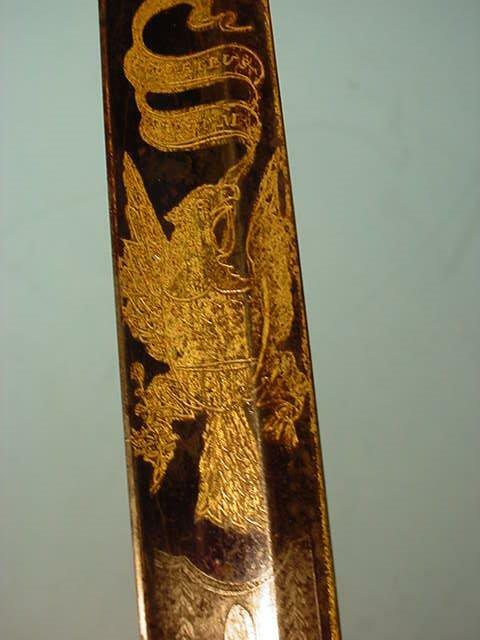 In its scabbard it measures about 42 inches long and weighs almost five ponds. 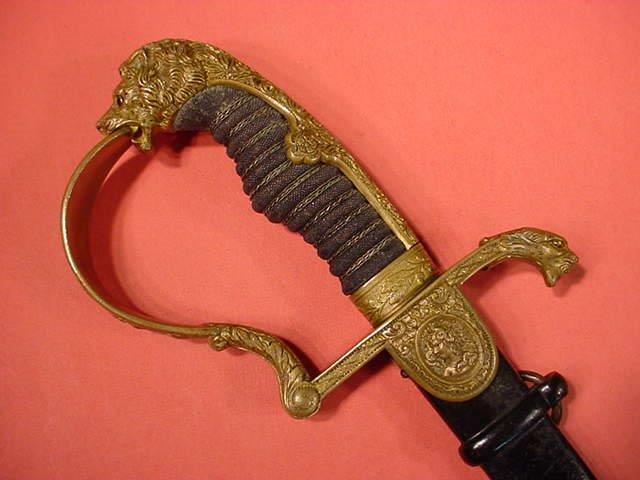 This sword was very expensive in its day. The epitome of the sword makers (Eisenhauers) skill. 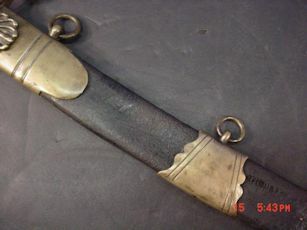 It was presented by one wealthy officer to another in fond memory of a journey they had made together back when they were officer candidates in the Prussian war academy, the blade has chiseled and raised words. 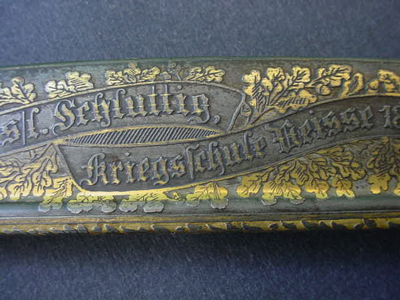 The inscription in German reads ‘Huhe S/L (Seinen Leben) Sehluttig Kreigschule Reisse 1895.” Realize that this was 116 years ago, along that side of the blade are depictions of a dragoon helmet, chest armor, swords, and a drum. 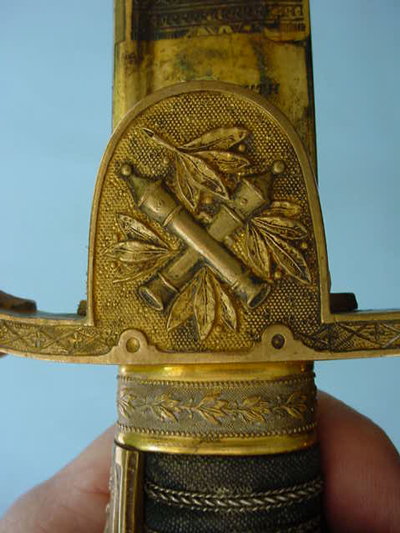 On the reverse side, we find flags, cannons, and knightly trappings such as swords, shield, battle axe, large drum, more swords, lance and standards...all of these weapons and instruments are surrounded with oak and laurel leaves. The sword has a mean blade with a bone breaker tip portion. 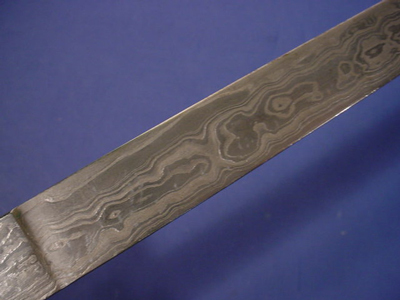 The Damascus blade is exemplary! 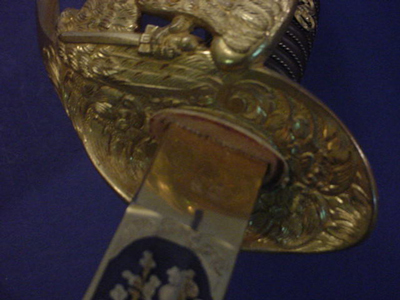 The whole sword is in excellent plus condition. A great sword! (Literally!) 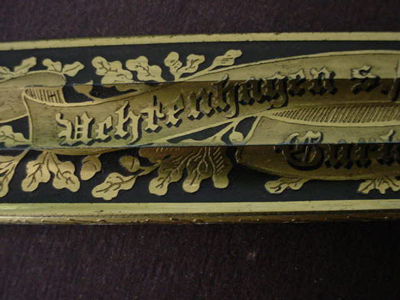 A great gift between two wealthy soldaten of the Kaiser. The most massive example we have ever seen. 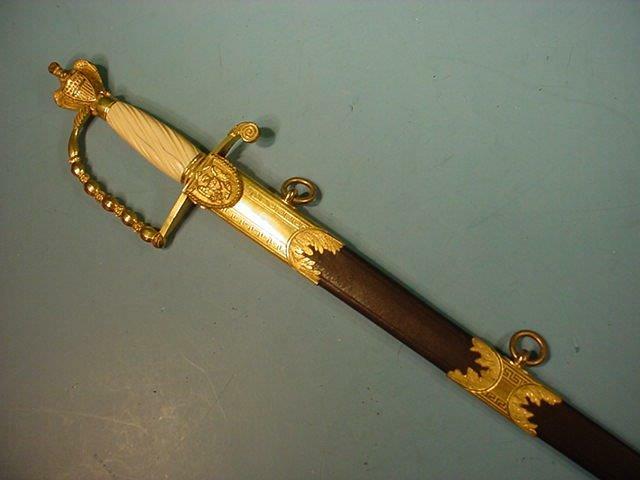 DESCRIPTION: Here is the finest model 89 sword we have ever encountered; it is in a word “spectacular”. 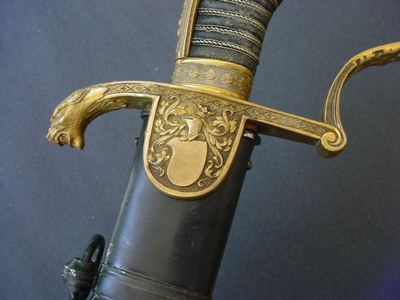 Absolutely the finest workmanship by the company that produced the state of the art swords for the Kaiser and Reich, Weyersberg-Kirshbaum and Co. (WKC). 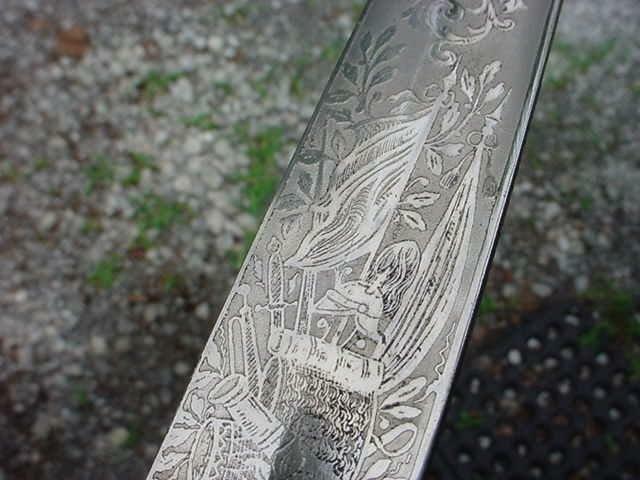 The history of this Solingen company goes back into the middle ages and its trademark ‘the king’s head’ was noted in 1560 but the heyday of sword making in earnest dates back to 1774 when Weyersburg first registered the ‘king's head ‘ as their trademark. 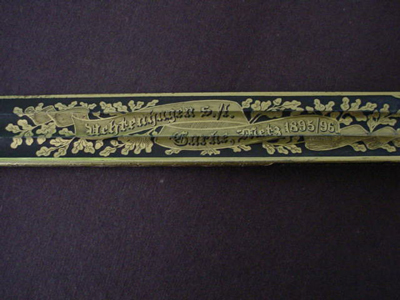 This was the company that made the famed sword for Kaiser Wilhelm II and presented it to him in 1899. 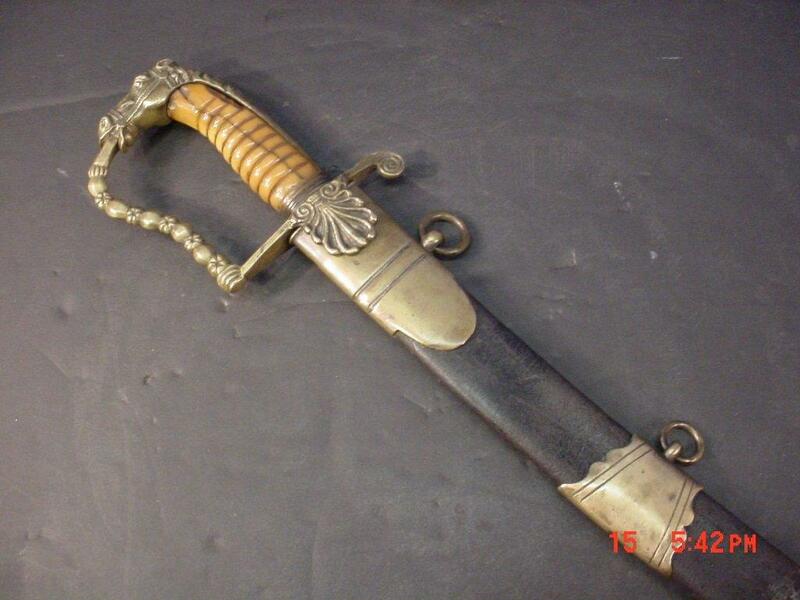 To see a miniature of this sword by WKC go to our Kaiserreich section (Item KWEP 4-8 & WILHELM 9-11). You can also read about the special presentation there also. 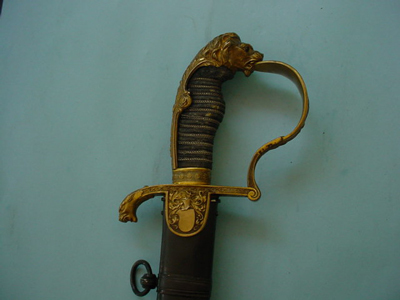 Nothing in Imperial edged weapons in the Kaisers Reich can compare with the quality of WKC swords and we present here one of the best of them. This is possibly the finest one we have ever offered in a Grosse Degen Mod 95 and probably the best any one has offered at any time that we can recall. 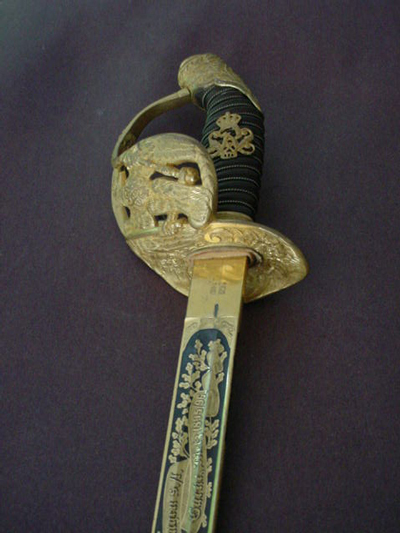 It is better than any of the 89’s that appeared in Tomas Wittman’s Horn Book on Imperial Swords and Daggers that was published under the title Collecting the Edged Weapons of Imperial Germany Volume 1 and there are some wonderful pieces from famous collections shown there, but none quite come up to the sheer beauty and exquisite construction of this particular gorgeous sword. 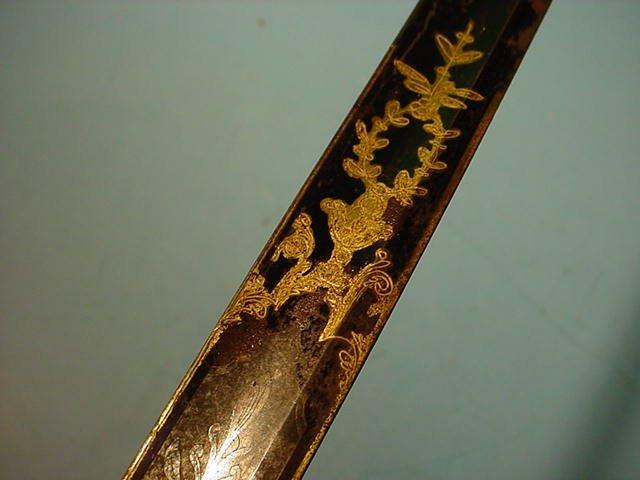 Beautiful and gorgeous may be far too conservative a description to the advanced collector of German swords. This one truly is the “Holy Grail” of the Grosse Degen. 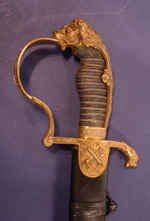 These model 1889 swords were generally based on French or Prussian cuirassier broadswords but with a distinct pierced semi-basket brass guard that is closed rather than open like our presentation grade Prussian cuirassier sabre found at Kaiser Reich weapons (KWEP 4-1); this was the official infantry officer degen 1.0.D 89. 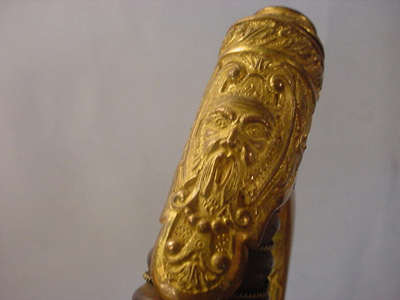 The gilded bent hilt sets it apart from all the other patterns of German swords of the era. 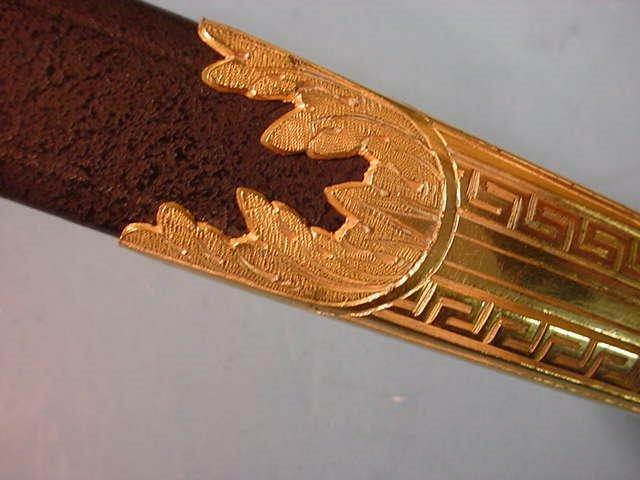 This one sports the greatest looking hilt imaginable -- graceful, flowing and the gilding is of the brightest richest, metallic look ever. 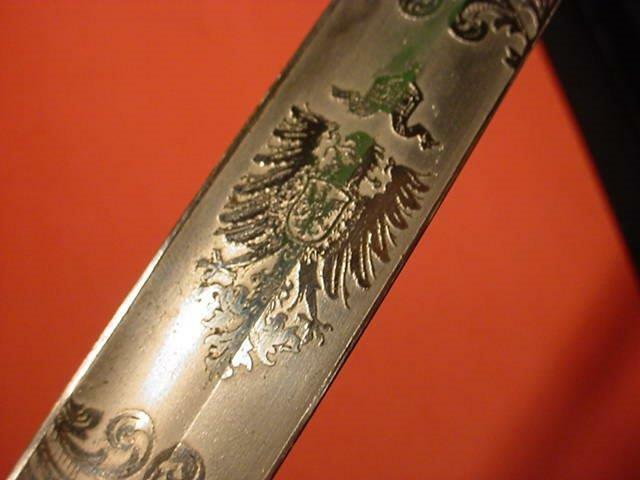 The Prussian eagle is beautifully refined and of the greatest detail imaginable and the sword is so fine that the eagle is even detailed (inside) the basket as well as outside. 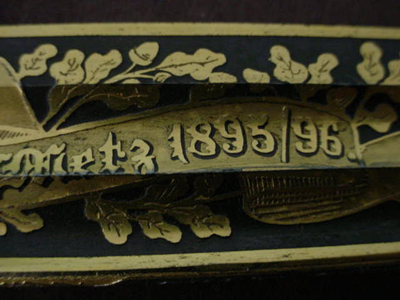 The Royal Wilhelm cypher in the center of the grip is also oversized, far bigger than in the regular 1839 models. 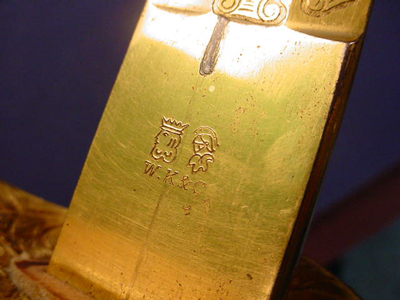 The pommel bears the likeness of the Nordic God Wotan and this is a clever addition because as king of the Gods of Aryandom he is a king in every sense of the word, and thus related I suppose to the King logo of WKC. 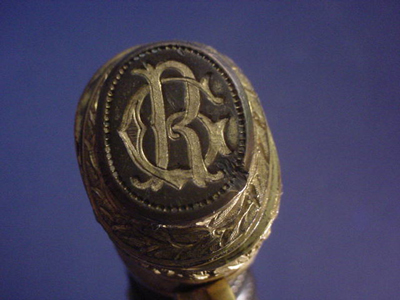 At the top of the pommel cap is an oblong crown with what seems to be the letters G & k or G&R depending on how one holds it for inspection (right side up or right side down). 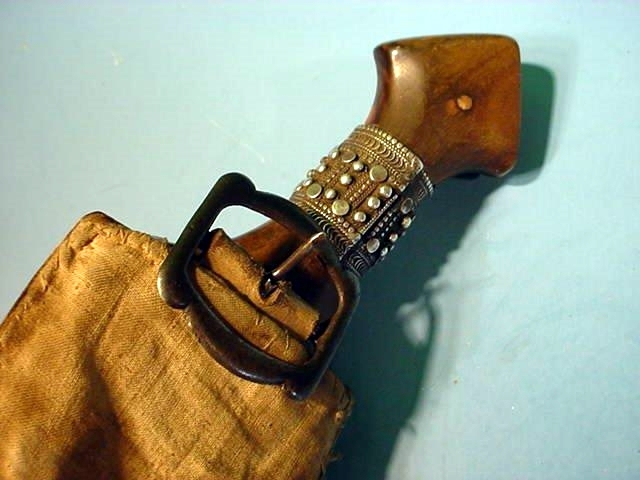 The grip seems to be made from some type of natural horn (possibly Rhino) from the German colonies in German East Africa. 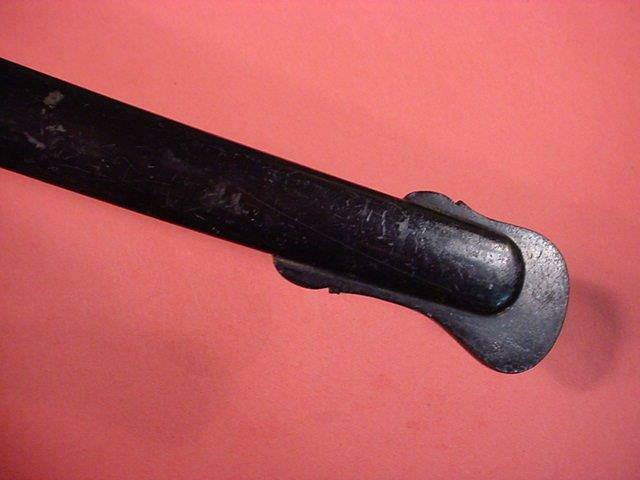 Even this sets this sword apart because I have never encountered this type of grip in any German sword (ever!). This had to be a special custom order and very probably genuinely unique. 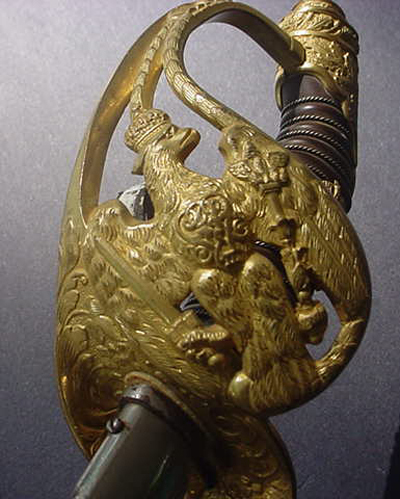 The entire massive grip and basket hilt are probably completely unique. The Blade: We have so far described for you to the best of our ability the absolutely unique Grosse Degen. 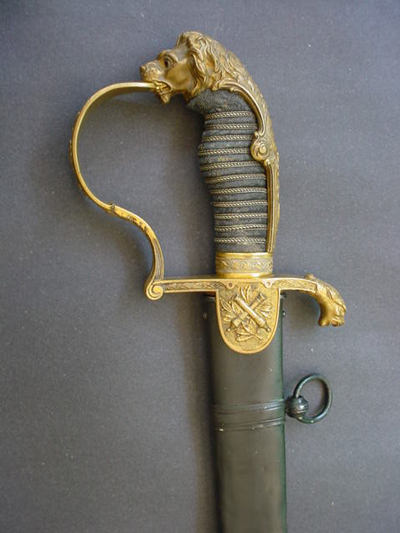 Other than the sword of Bismarck and the personal sword of Kaiser Wilhelm II, this is without a doubt a weapon that would be shown in the near vicinity of those illustrious swords if it were in the Klingen Museum in Solingen. 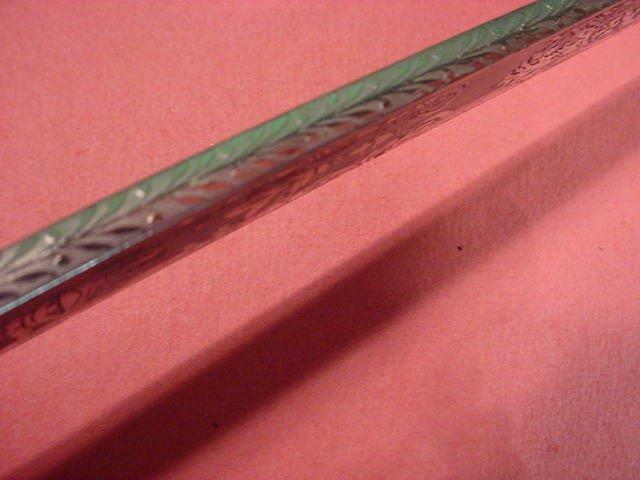 Now it is time to describe one of the most beautiful and awesome blades we have ever seen on a mod. 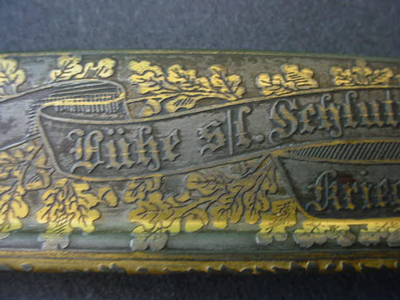 1889 Preussisch Infanterie Offizierdegen. 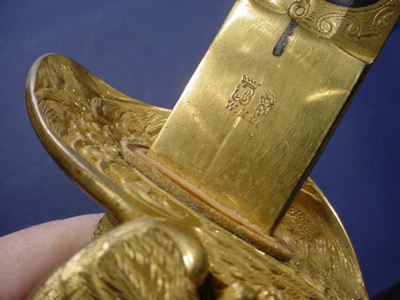 Let’s start with the markers name and logo found at the base of the blade where the blade meets the guard, usually the letters WKC and the king’s head are shown but obviously since this was a very special sword custom ordered and produced you will see both the king’s head and the knight’s head. 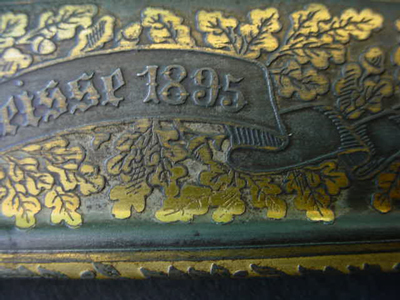 This symbolizing the amalgamation of Weyersburg and Kirshbaum in 1883. 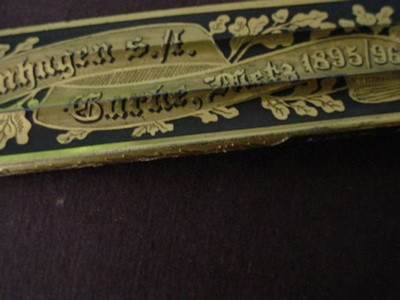 They were the two most famous sword making companies in Solingen Germany. 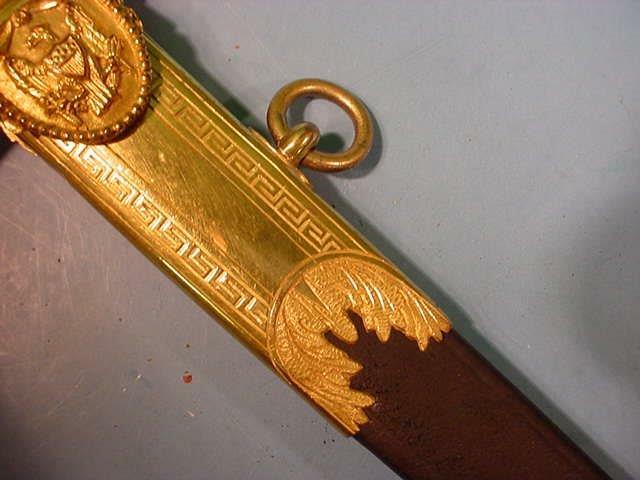 On the back strap or top edge is the name of the retailer who ordered the sword from WKC at the purchasers specifications. This was the firm of Gustave Gunther in the city of Metz. 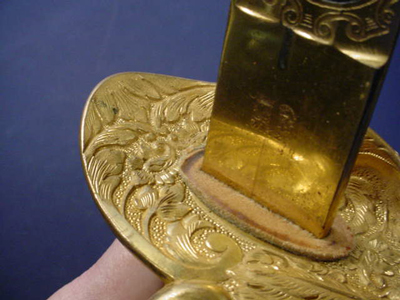 All the wonderful gilding is still intact and bright on the blade and where it is seen with a black-blue background. It is prodigiously stunning to say the least! 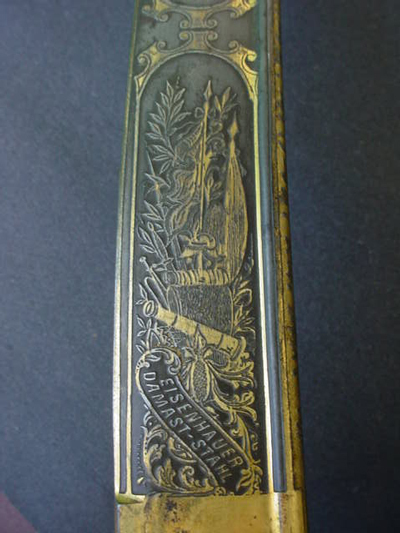 On the front side is the legend that looks like Wehtenhagen S/L (Seinen Leben) Garke Metz 1895/96 so we know that the sword was presented in the same town that it was ordered in and this was ‘Metz’. 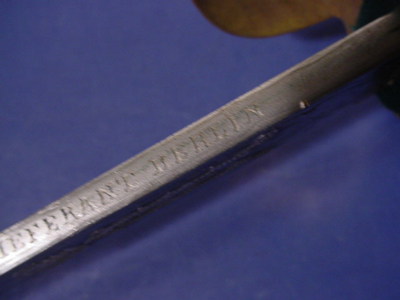 The lettering is so pronounced in the blade that it could be read in Braille. 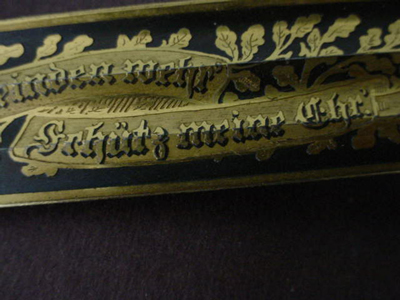 All around the scrolls containing the letters are branch’s of Eichenlaub “oak leaves”. 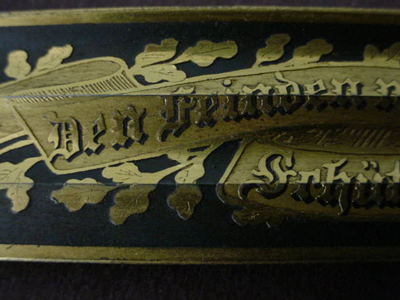 On the reverse side in a scroll is the saying in German ‘Den Feinden Wehr Schutz Meine Ehr!’ In German this can translate to either made to defend me from my enemies and to protect my honor, or, it can mean ‘defend and protect me from my enemies’! 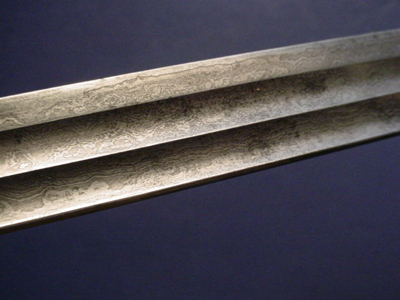 The sword was for a big man; it is fully 3 foot 4 inches long in its scabbard. 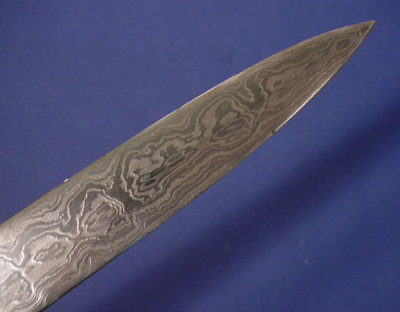 The blade is made with maiden hair pattern damascus. Genuine Damascus! 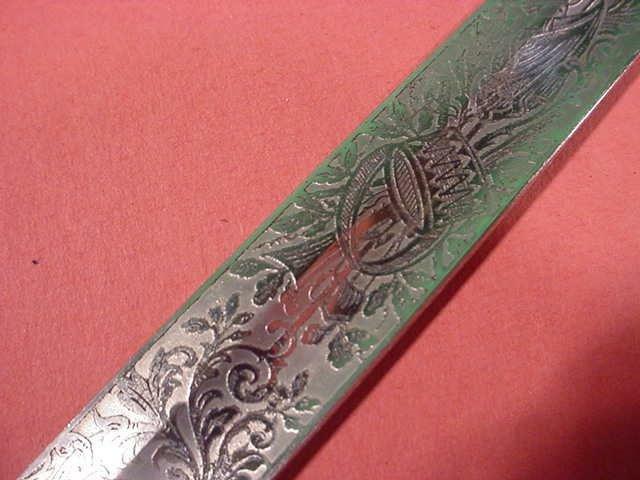 Not etched Damascus. It has a triple blood fuller-deeply grooved. Excuse me for the continual usage of the word beautiful but again, this word is almost insufficient to use when describing this awesome looking blade. If I am somewhat repetitive in my description it is only because I am fully under the charming spell of this magnificent sword. Last but certainly not least there is a monogram that it is not actually a royal cypher. 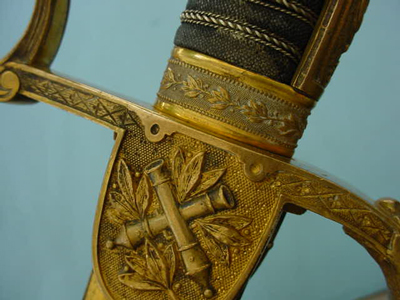 It is for a Kaiserlich regt. 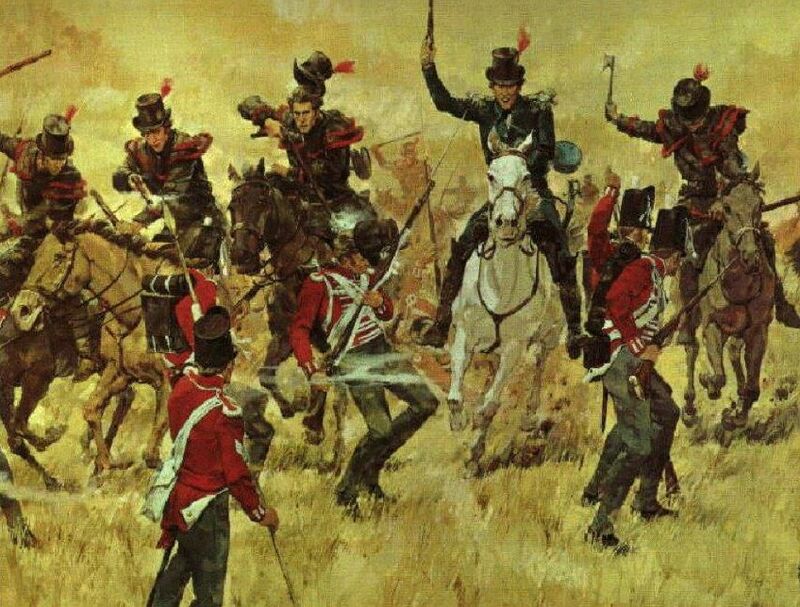 of guards and it well might be the Forth Royal Grenadier Regt. Number (4). We can use some help on this one. 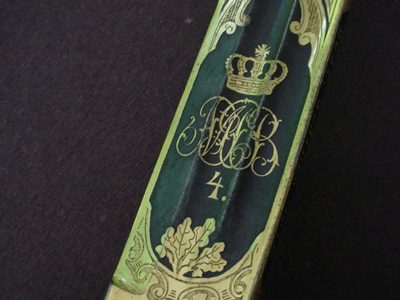 The numeral 4 is topped with a classic intertwined set of initials surmounted with the Prussian crown. So what can we say except to use all those praise worthy descriptive words again. So that we are not so repetitive we will use a word that seems to cover all bases and we will declare this unique weapon ‘pulchritudinous’. Certainly there is not another available anywhere that could be deserving of this description. 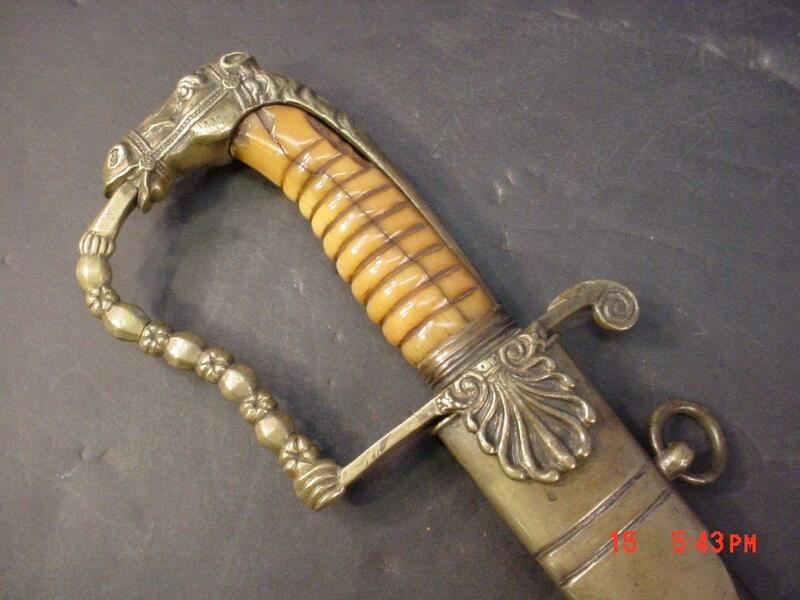 DESCRIPTION: This is at least one of the grandest American swords of the War of 1812 that we have ever seen. 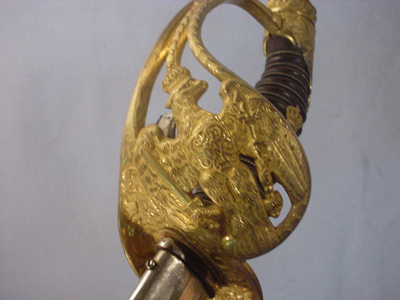 It belonged to Colonel George Edward Mitchell (1781-1832), Baltimore or Philadelphia circa 1818, with full and unusual eagle and shield pommel above a faceted five ball (D) guard and carved-bone grip and with imported blade retaining most of its gilding and bluing and engraved with patriotic emblems including American eagles, Liberty with a feathered Indian headdress and a panoply of arms as well. 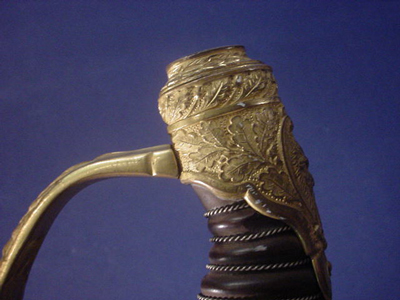 It is accompanied by a brass-mounted leather scabbard length 38 3/4 inches. 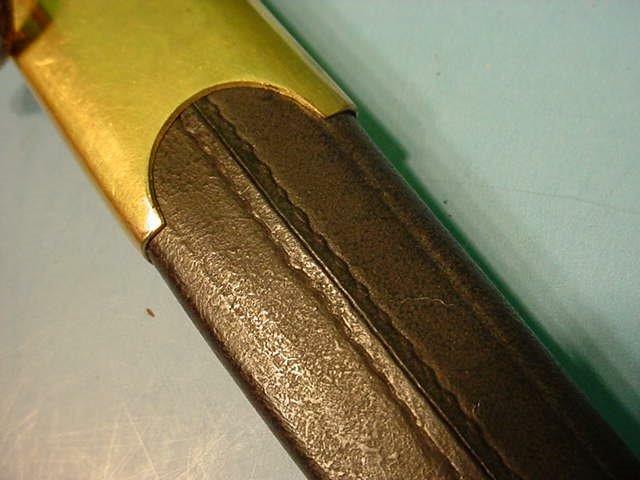 The leather on the scabbard is replaced with fine museum conservation methods (Absolute Perfection). 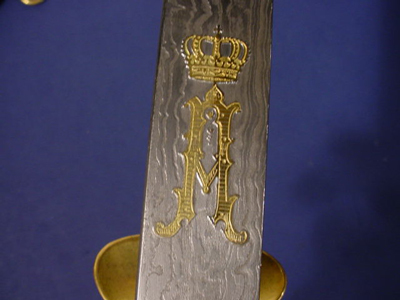 The sword was presented to Col. G. E. Mitchell, a physician in the Third Maryland Artillery by the Maryland General Assembly in recognition of his distinguished service during the battles of York, Fort George, Fort Niagara, and especially Fort Oswego, N.Y. 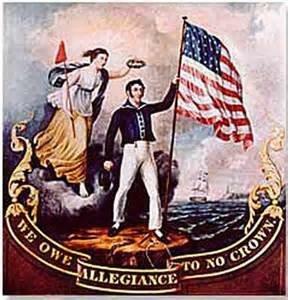 In several places on the Internet are notes about his service in the War of 1812. In that year Mitchel raised a company of volunteers in Cecil County Maryland to enter active military service in the summer and fall of 1812. 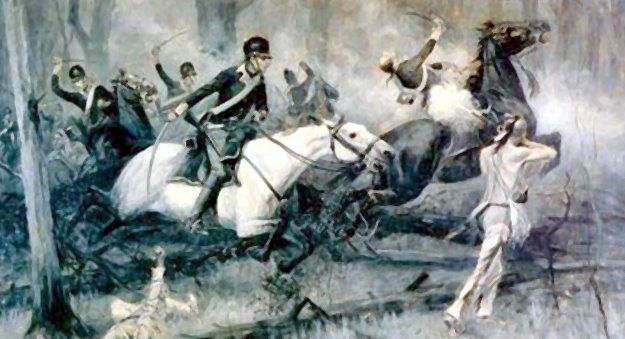 Then-Major Mitchell and his Cecil volunteers went into the camp at Albany, New York, and then entered the campaign against the British on the Canadian Front. 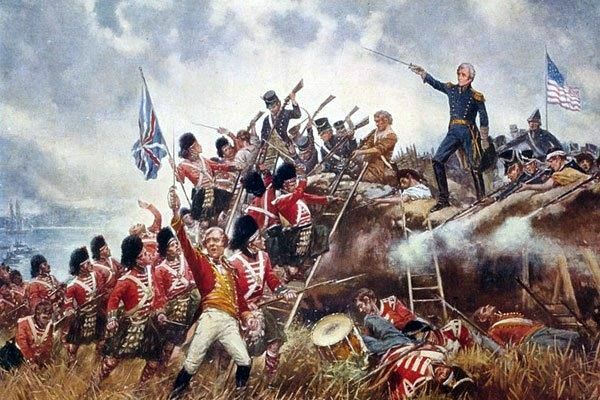 On March 3, 1813, Mitchell was honored for his valuable services in Canada by being promoted to the rank of lieutenant colonel and the following year was promoted to colonel for his gallantry at Oswego. 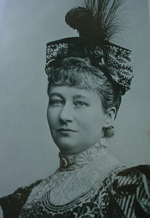 Colonel Mitchell was the first to announce the news of peace to the British authorities in Canada. George Edward Mitchell was born in Elkton, Maryland, the son of Abraham Mitchel and studied medicine at the University of Pennsylvania graduating in 1805. 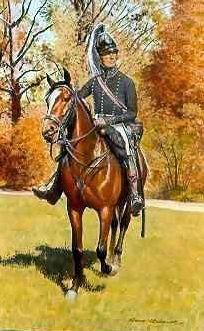 He practiced with his father in Elkton from 1806 to 1812. Mitchell also served in the Maryland House of Delegates in 1808 and 1809 and was elected a member of the state Executive Council and served from 1809 to 1812. He served two terms in the U.S. House of Representatives between 1823 and 1827 and was instrumental in inviting Lafayette to return to the United States in 1824. He ran for governor of Maryland and lost in 1829. Mitchell then returned to the House of Representatives and died in office in 1832. He is buried in the Congressional Cemetery in Washington, D.C. The papers of Col. George E. Mitchell are in the collection of the Maryland Historical Society. You can find similar information by searching the Internet. 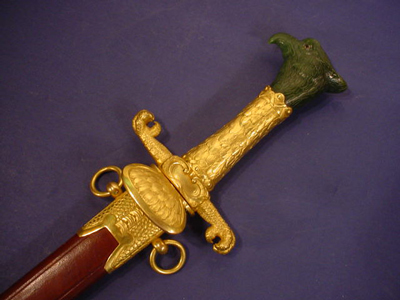 The Governor of Maryland later presented him with this elegant sword in honor of his bravery. 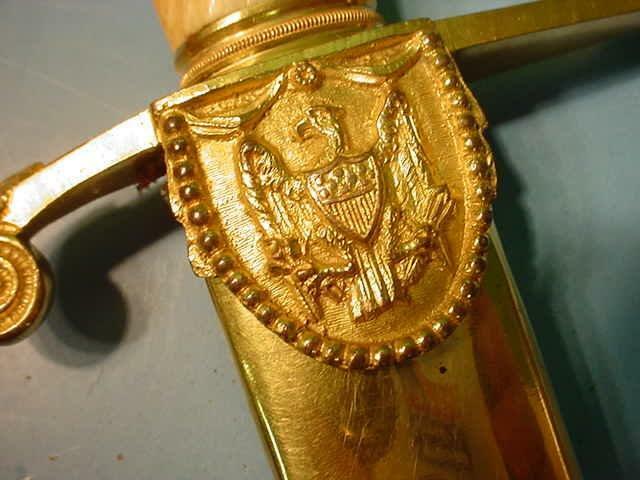 Here, my collector friends, is the chance to procure not only a stunningly beautiful American sword, but to capture a profoundly important piece of United States history. This accounting mentioned is found on any number of search engines at “Upper Bay War of 1812 Maryland Centennial.” Then click notable people. Mention of Mitchell can also be found at Wikipedia’s accounting of the Battle of Oswego. Here was a true American hero! 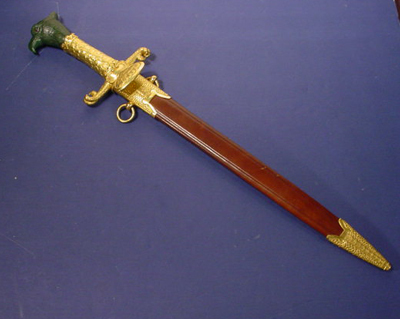 DESCRIPTION: Grosse Degen means “Great Sword” in German. 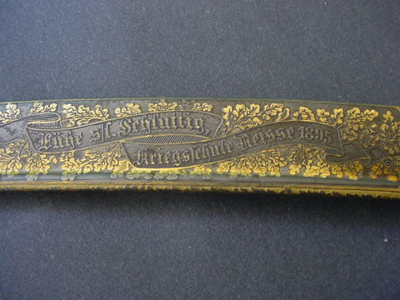 These were the oversized, beautiful swords (usually Prussian) that often were presented as gifts from officer to officer as a token of “Kameradschaft” (sincerely appreciated friendship). You can see such presentation swords earlier on this page. 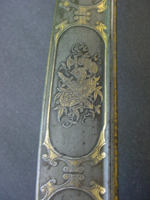 This particular Grosse Degen is not such a gift, but probably is a sword purchased for the personal use of the Prussian officer, himself. 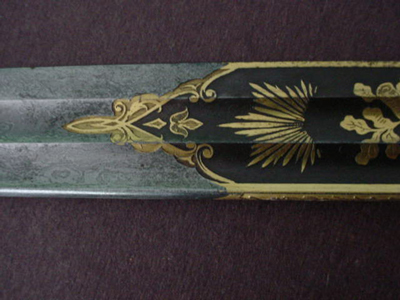 It measures 3 feet long in its scabbard. 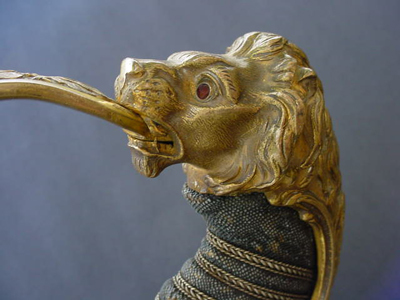 It has the typical lion-head pommel. The beast holds the top of the “D” guard in his teeth. 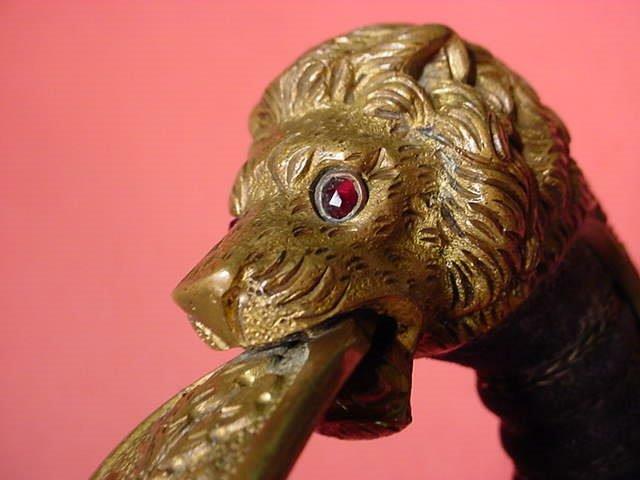 The lion’s eyes are mine-cut red stones, which are very probably rubies considering the fact that when you look under magnification you can clearly see the distinctive jeweler cutting. 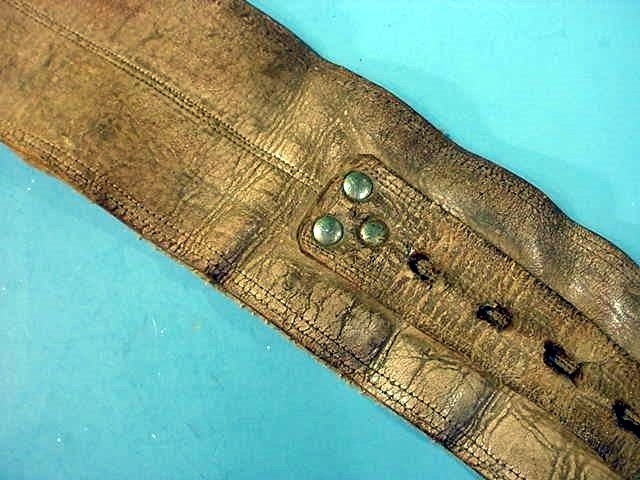 The grip is covered in ray skin and wrapped with triple strands of fine decorative wire. 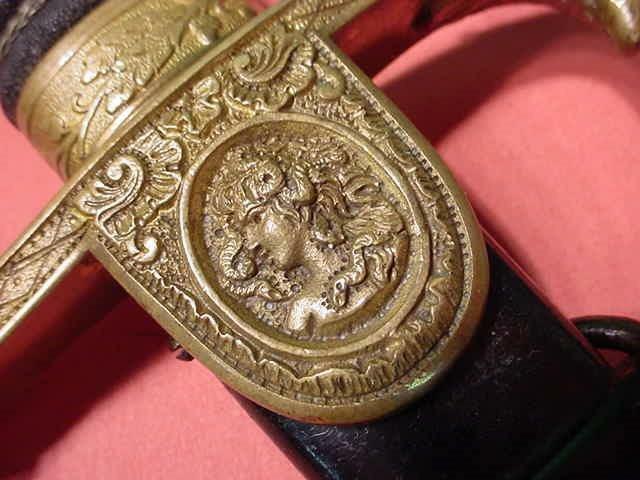 The languet in the middle of the crossguard is quite unusual in that it depicts the snake-encrusted head of Medusa the Gorgon, slain by Perseus in Grecian mythology. 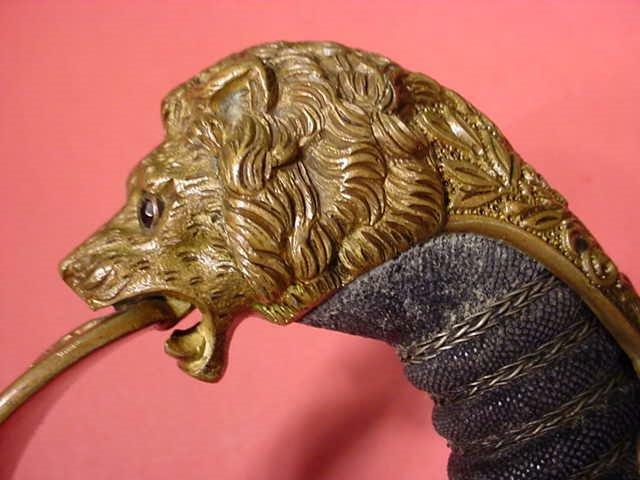 The crossguard has the female lioness grimacing at its end. 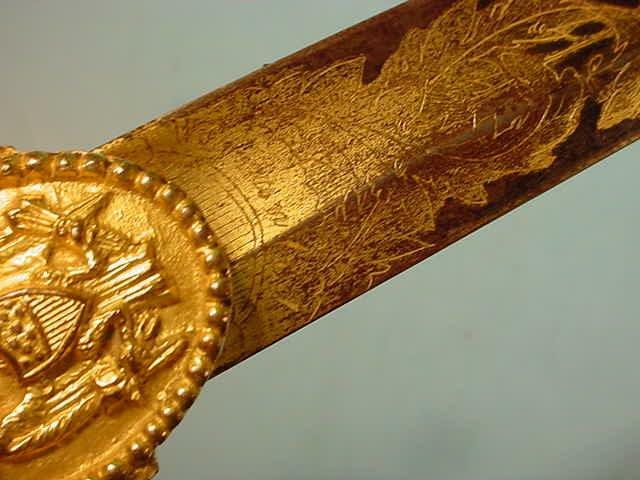 The “D” guard is decorated with oak-leaf sprays. 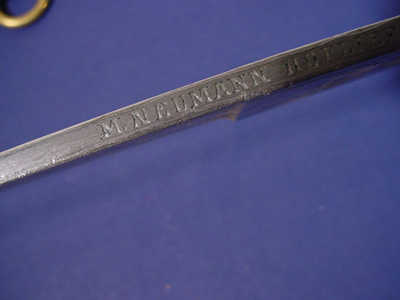 The blade has the company name of F. Danaschke and this firm had the title of “Hoflieferant” in Berlin. 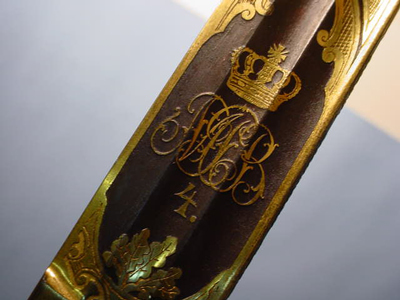 This particular wording identifies and denotes the distinctive, honorable title of “Maker to the Palace.” Only firms that produced items for the Hohenzollern royal dynasty were authorized to use this special description, so this is a very special sword. The blade is absolutely beautiful. 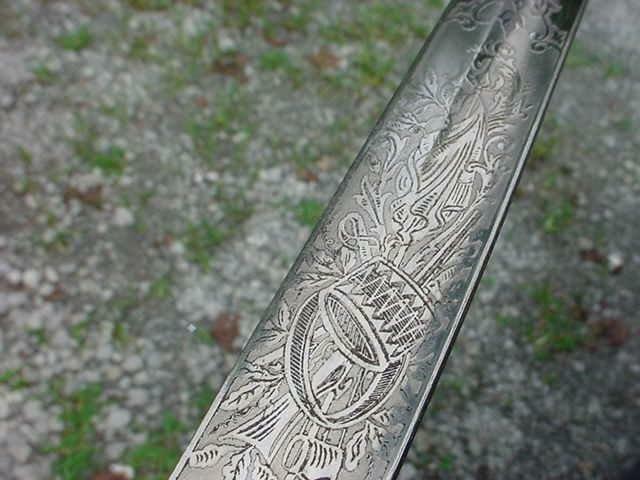 Although it is not Damascus it is super fine in Solingen steel with highly etched patterns that include the royal Hohenzollern crest or shield and panoplies of weaponry, swords, shields, bows and arrows, battle axe, Grecian or Trojan helmet, flags, standards, and profuse floral design. 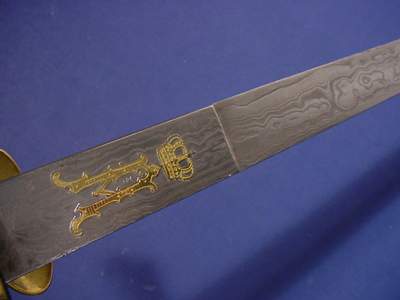 The blade is immaculate except for a couple of the slightest dings three quarters of the way up the blade; so minute that they are “hardly noticeable.” The scabbard has its original black paint. 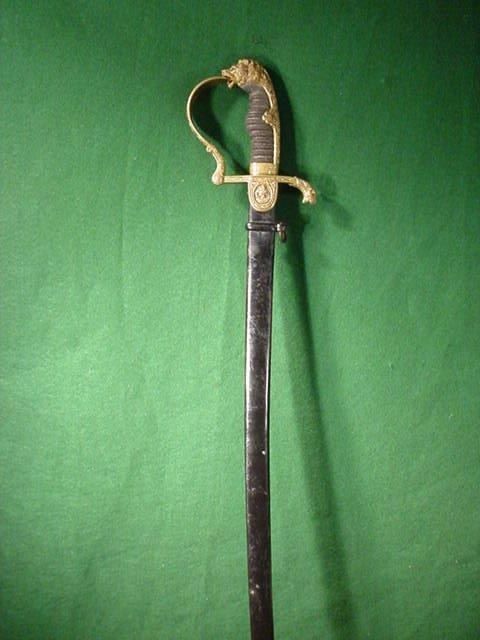 Overall, we have here an excellent-condition sword with prestigious historical importance. 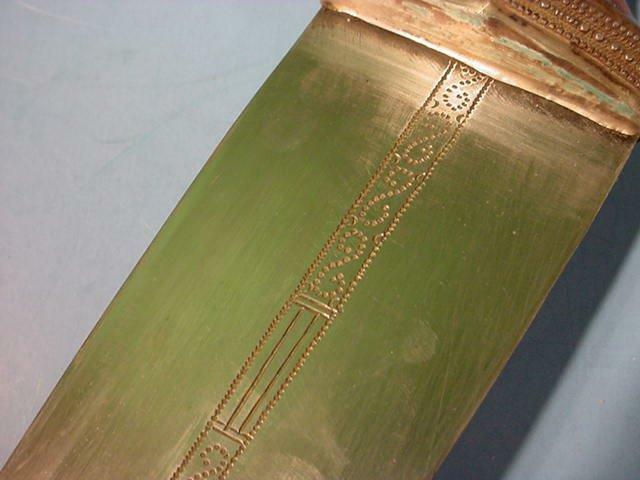 I would think this one is from the late 1880s and it’s just as nice a one that you will ever see. Pieces like this are in lieu of a better phrase: practically extinct! You just never see one offered anymore, even at the German military shows. Grab it while you can . . . it’s a bargain and a treasure. DESCRIPTION: Here is an “absolute treasure”! 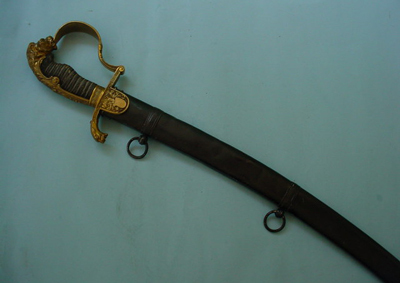 A cavalry sword used by an officer of the American army in the War of 1812 against the British forces. This sword is not only superb, but it is truly rare! 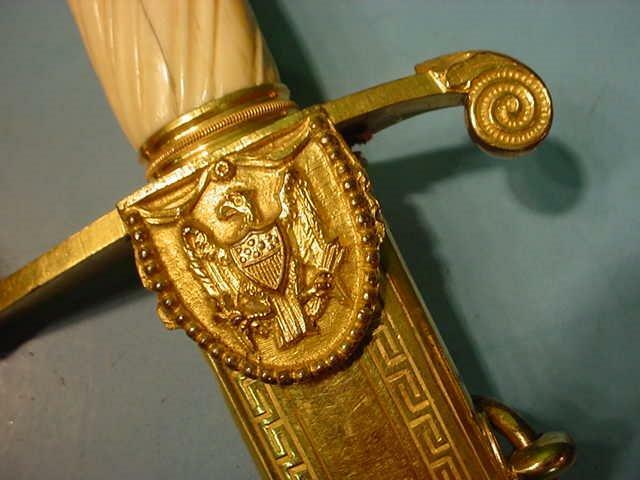 The American swords with eagle-head pommels have been the epitome of weapons and are always actually admired throughout the world and have found their way into some of the finest collections and museums in the United States and abroad. 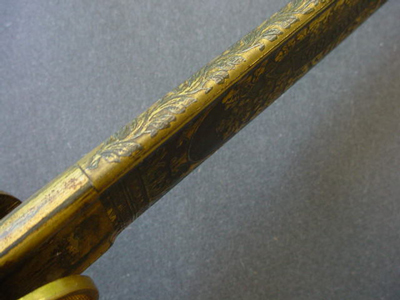 Many books have been published listing and picturing many of these fabulous weapons. 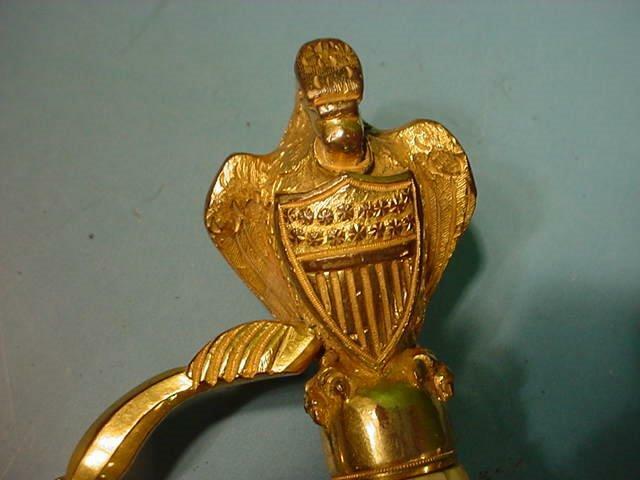 It was the War of 1812 that brought some of the finest sword smiths forth and the eagle heads added to American sabers were now in vogue. In 1782, by an act of the Continental Congress, the bald eagle became the national symbol. 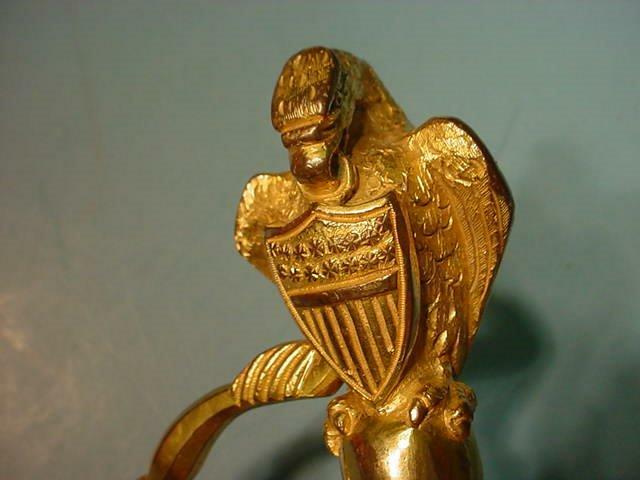 In fact, the eagle became firmly established as America’s symbol and it became the most popular one ever devised. 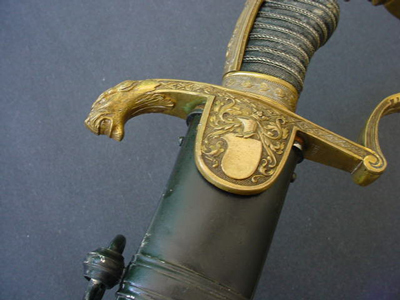 Ever since the late 18th century the eagle has been a favorite in every form of decoration, not the least of which was the officer’s personal sidearm—his sword. 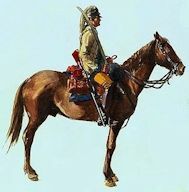 The only deviation from this rule was the rare horsehead pommel that seemingly was used exclusively by cavalry units such as the American Light Horse and Pennsylvania Light dragoons. 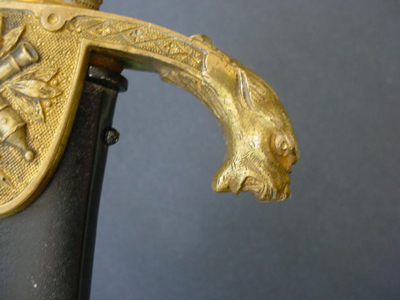 By the time the War of 1812 began, dozens of styles of the eagle pommel had surfaced, but very few horsehead models were seen, and even this time being used only by these elite units of horse soldiers, especially the 1st, 2nd, and Light dragoons. 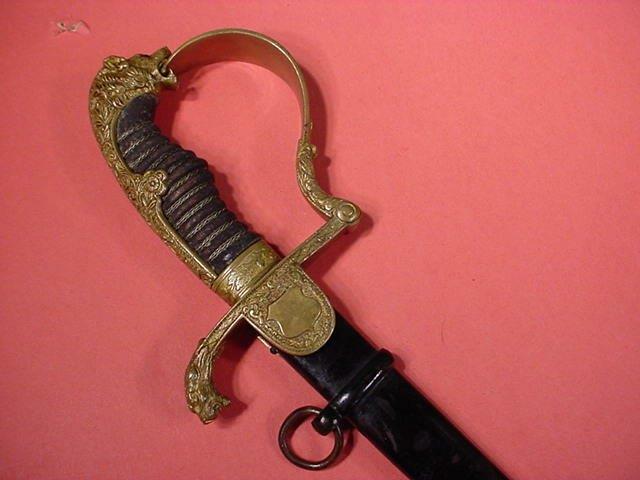 The former owner (collector) said his original information was garnered from the elderly gentleman from whom he obtained the sword. 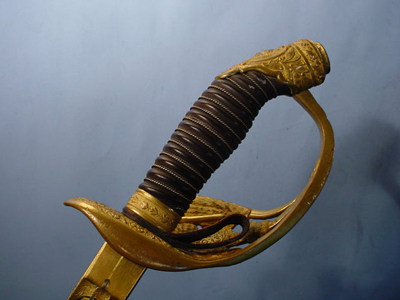 He said that the sword had been willed to his grandfather by a veteran of the 1812 war, who was attached to the Maryland Light Dragoons. The sword is in beautiful condition with beautiful bone grip with the wonderful horsehead pommel. 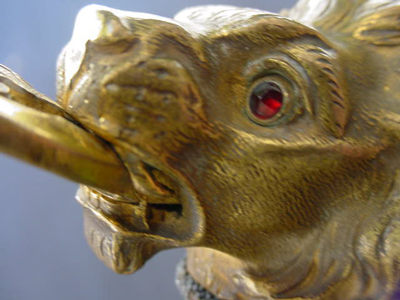 The horse is fitted with a bridle in the typical English style. 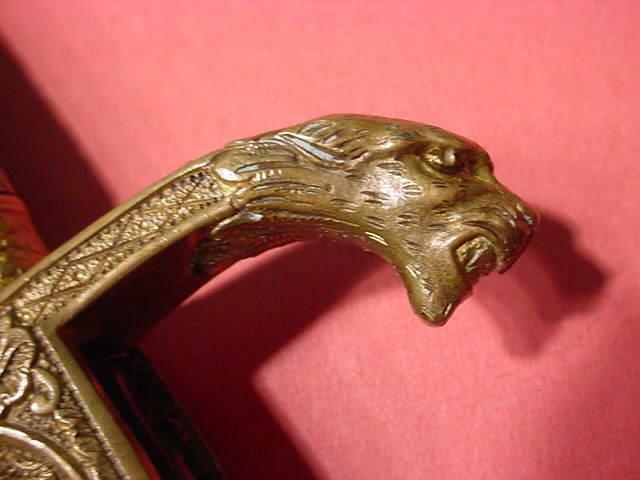 His mane floats down the back of the bronze grip. 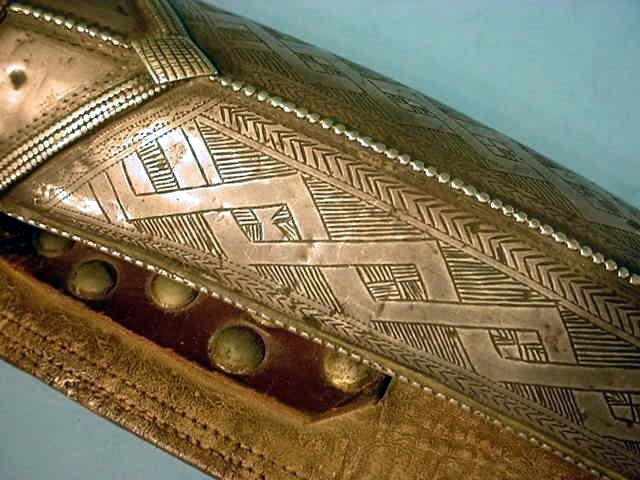 The “D” guard is molded in an orb motif and floral pattern, and emerging from the bottom of the crossguard is a beautiful clamshell languet. 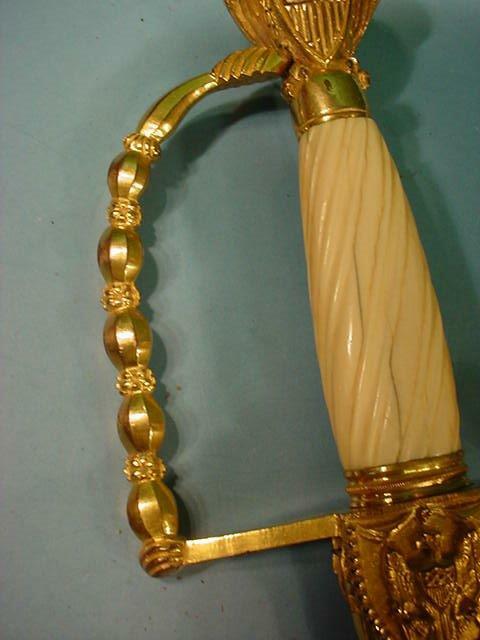 The bone grip has turned in color from white to a smooth, soft brown. It has the usual ages-old cracks as you can see in our images. 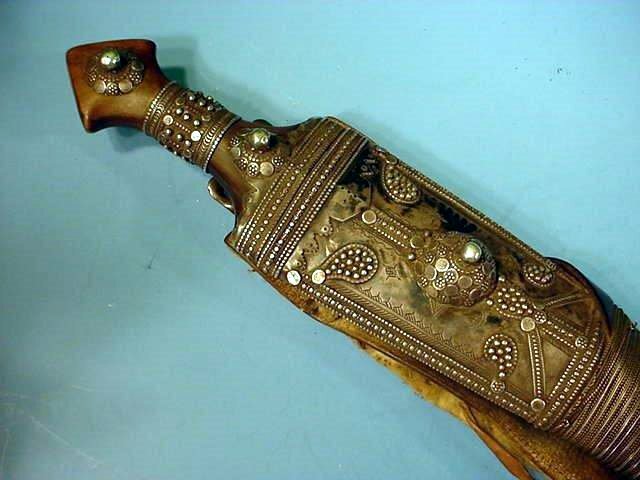 This is completely usual on sword with bone grips from the era. 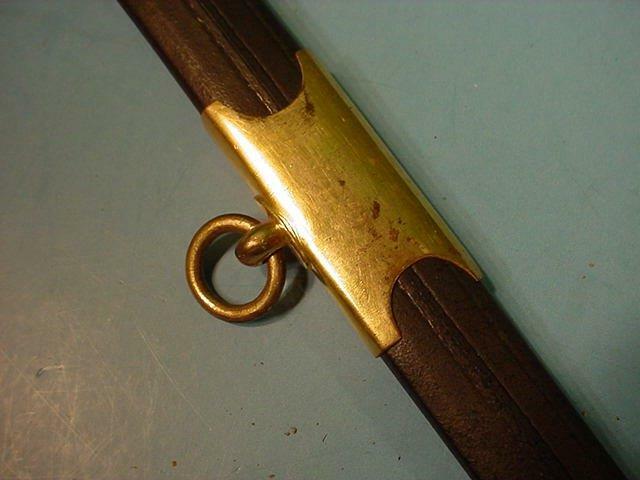 The leather scabbard is intact with the usual slight minute cracks, but is still sound and intact. 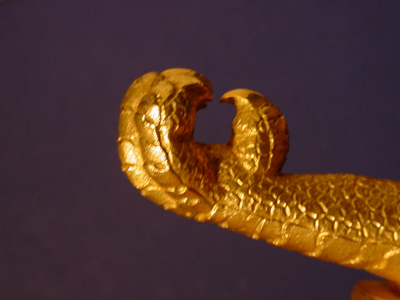 The metal fittings at throat, midsection, and boot are sound. 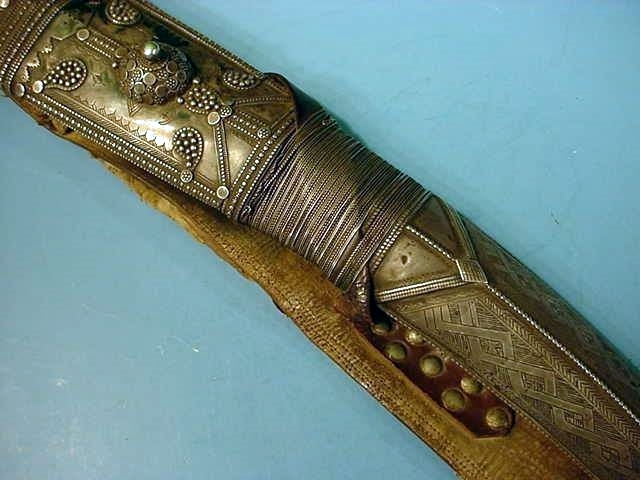 This is highly unusual because 99 percent of swords with leather scabbards of this period are missing their sheaths due to the elements and of age. 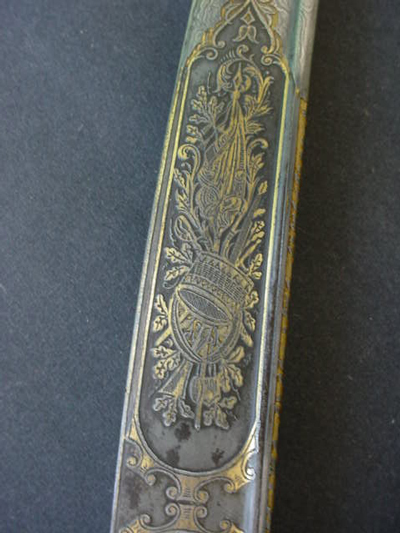 To have a complete scabbard as this marvelous example has is extremely rare. The sword is also “immense” compared with other swords of the period. It is a full 40 inches long and this indicates that this horse soldier was a very large man; unusual for cavalrymen, however, certainly not without precedent. 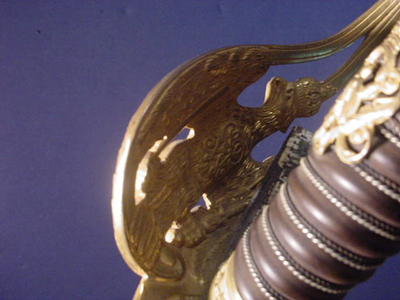 The blade of this sabre is also great. 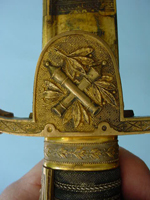 It is blued and gilded and underneath the languet and crossguard is the company name, “J. 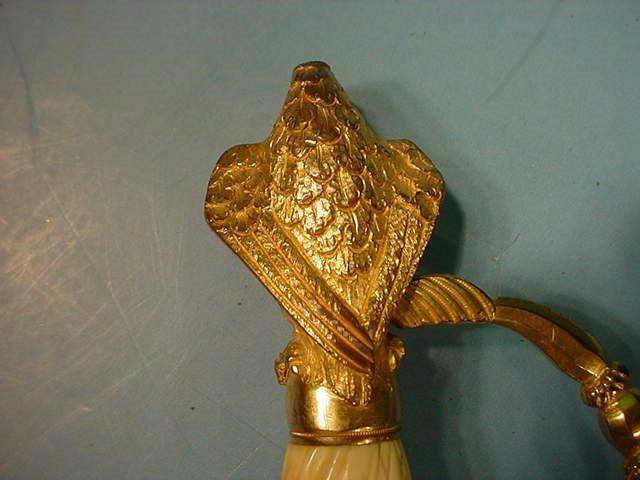 Cooper.” This name is under a potpourri of depicted weapons, such as pikes, cannon, halberds, and a Romanesque helmet. 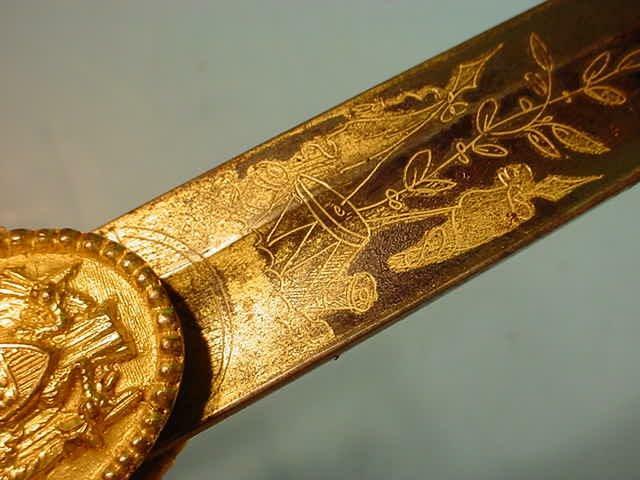 In the center of the blade is the U.S. federal eagle with the banner proclaiming E Pluribus Unum flanked beautifully by floral sprays. 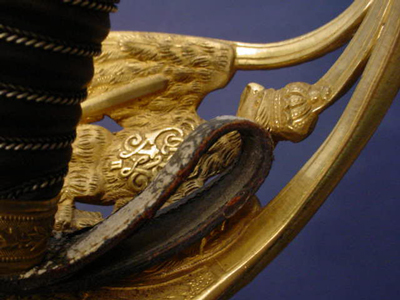 On the other side we have floral décor and another potpourri of weapons, but central to all of this is the most telling symbol that seems to prove that this was an 18th century Dragoon sword. 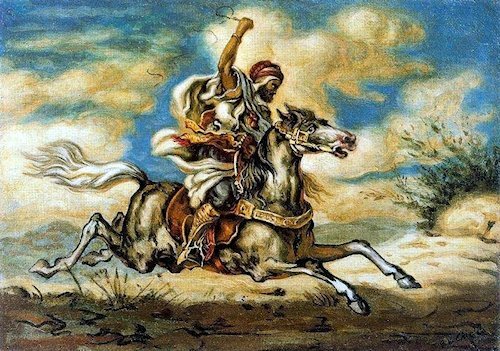 Here we see a mounted dragoon officer brandishing a sword and he wears the typical dragoon helmet that was modeled from the gladiator helmets of Imperial Rome. 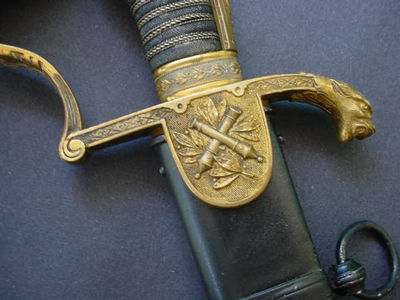 This is undoubtedly the greatest American sword we have ever had the pleasure of offering and the finest we have seen offered in the field in many a year. Something like this comes along once in a lifetime. Don’t miss it if you are a serious collector, or even if you simply want a fantastic prodigiously important item of American history. 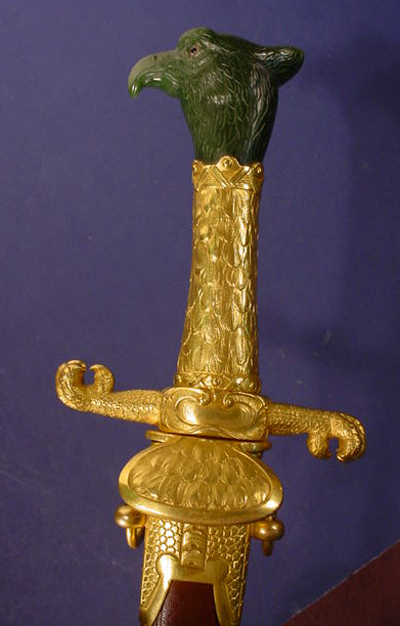 DESCRIPTION: Here is the ultimate in royal gifts when it comes to weapons -- this is the actual falconry dagger that was presented to Prince Adalbert of Prussia 1884-1948 by his mother, the wife of Kaiser Wilhelm II (Empress Auguste Victoria) of Schleswig Holstein 1858-1921. 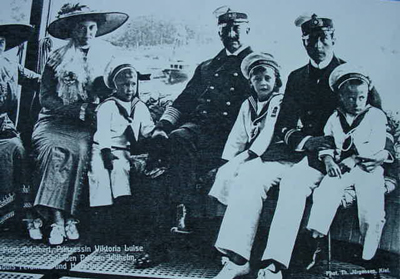 She gave birth to seven children by Kaiser Wilhelm II, German Emperor and King of Prussia: Crown Prince Wilhelm 1882-1951, Prince Eitel Fredrich 1883-1942, Prince Adalbert 1884-1948, Prince August Wilhelm 1887-1949, Prince Oskar 1888-1958, Prince Joachim 1890-1920, and Princess Viktoria Luise 1892-1980. 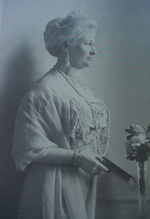 The Kaiserin dearly loved all of her children and she absolutely hero worshipped her husband, but the child she seemed to favor most was Prince Adalbert and she was often seen with him at Royal occasions and rallies prior to the war years and during WWI as well. They were often seen together at major events and even at minor fund raisers, etc. 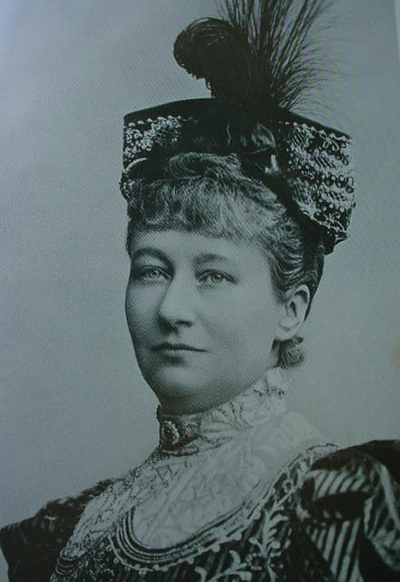 She was a good mother and wife and she was extremely conscientious in carrying out the public relations, plus charitable and welfare work that of course was an expected part of Royal duties. 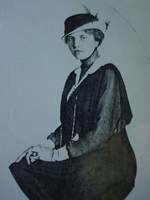 She had great interest in German cultural pursuits and a definite engrossment and actually a vivid affection for the arts. There was a genuine and widespread sense of loss and mourning amongst ordinary Germans when she died. Her funeral was marked with much spontaneous public grieving as well as the more formal solemn rituals of the Imperial Prussian state. 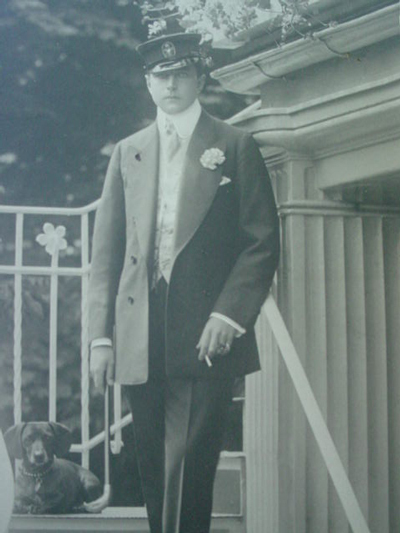 Prince Adalbert, the third eldest son of Wilhelm and Auguste Victoria was born in the Hohenzollern Palace at Potsdam on 22 September 1884 and died in Switzerland 22 April 1948. 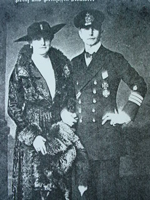 He married Princess Adelheid (Adi) of Saxe Meninigen (1891-1971) on the 3rd of August 1914 in Wilhelmshaven, Germany. The young Prince had a passion for the tales and swashbuckling sagas of the sea and of course we know he was named after the earlier Prince Adalbert (1811-1873) who through the Hohenzollern Hierarchy was his distant relative. 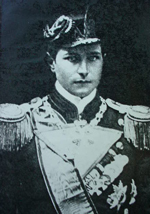 This Prince Heinrich Wilhelm Adalbert was the commander in chief of the Prussian Navy, as well as a great naval theorist and admiral of great renown in the turbulent 1840's and 50's. 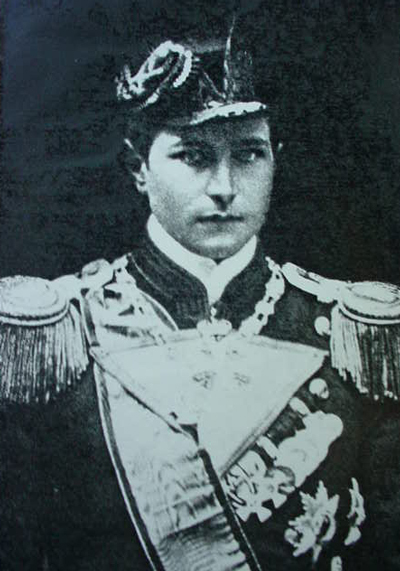 He was instrumental in the revolutions of 1848 and in founding the first unified German fleet, the Reichsflotte. 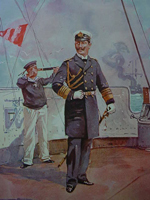 During the 1850's he did much to form and establish the Prussian Navy as an independent naval power. The dream of our young Prince Adalbert, Ferdinand, Berenger Viktor, “Hohenzollern” was to become a naval officer in the tradition of his illustrious ancestor and he was ever cognizant of the fact that the Kaiser, his father was extremely obsessed with the sea and naval affairs. 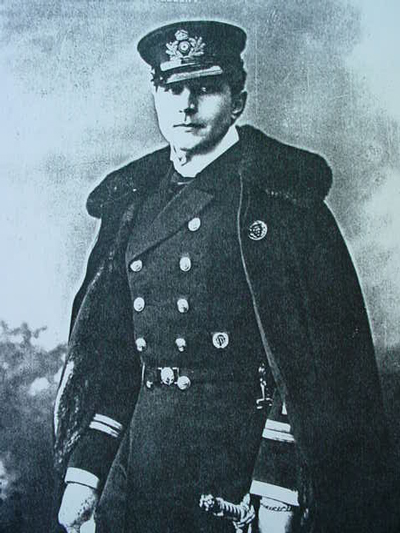 In 1889 at the inauguration of a new seaport in Stettin on September 1898, the Kaiser stated these prophetic words: "Unser Zukunft Liegt auf dem Wasser." 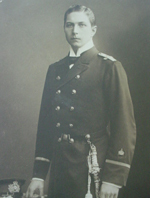 (Our future lies on the water!”) And three years later Prince Adalbert officially joined the Kaiserliche Imperial Marine. 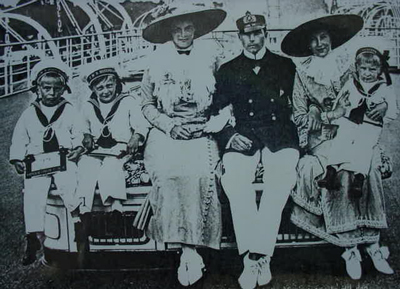 It was the greatest day of his life and he entered as an officer having earned his rank in the naval reserve. On this auspicious occasion his father, the exceedingly proud Kaiser, presented him with a magnificent (one of a kind) cased and heavy naval dagger and ‘What a dagger’!!! 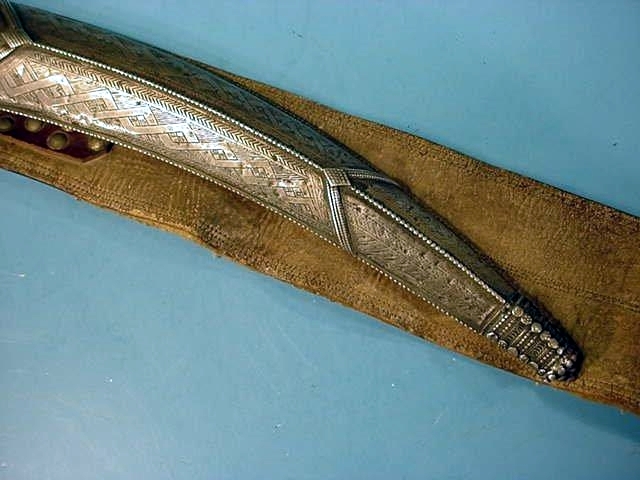 Unlike any other dagger of the Imperial Navy, this one was entirely constructed in silver (800), not brass as would be usual and it had a genuine ivory grip. 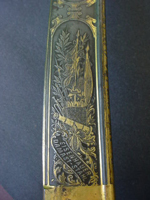 The blade was made by the WKC Company - “Weyersberg und Kirschbaum” who were so proud of it that they featured it in their turn of the century catalog as a prime example of their mastery of the art in the production of swords and daggers. 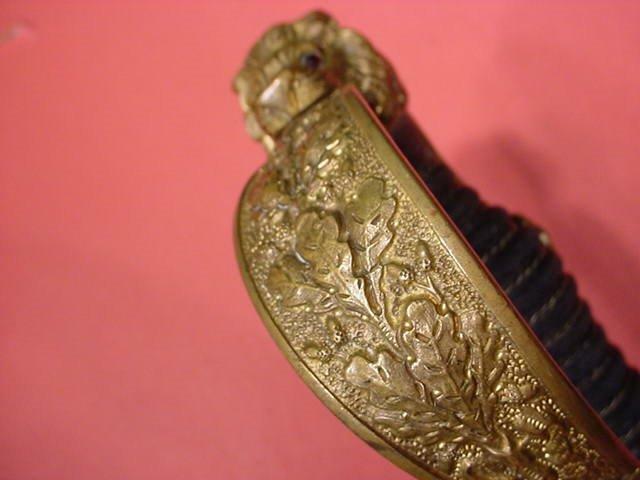 The fittings and scabbard were by the famed Berlin jeweler to the royal palace, Sy & Wagner. 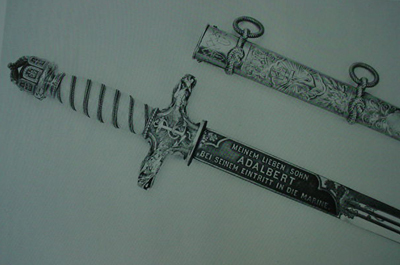 In very highly raised letters the legend on the blade said “Meinem Lieben Sohn Adalbert Bei Seinem Entritt In Die Marine." 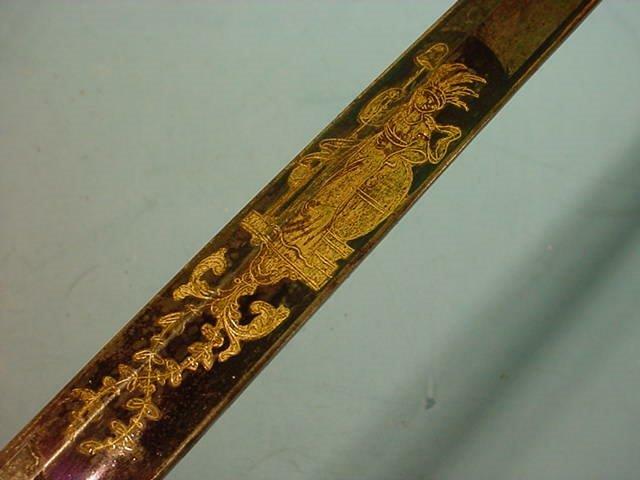 Even the scabbard is a work of art. 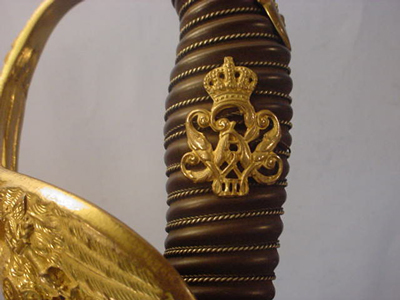 In the mid-section of the scabbard is the letter (A) and above it the typical crown of the Prussian prince. 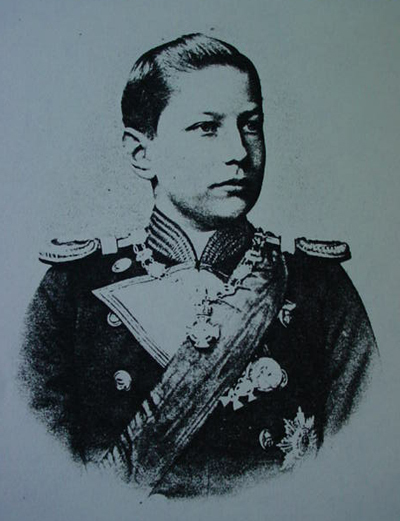 Originally Prince Adalbert was presented to the German admiralty on 24 June 1894 at the tender age of 10 years old. 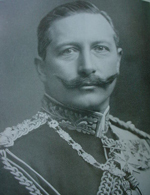 On this occasion the Kaiser said of his son “This moment when Prince Adalbert becomes one of you is of the most eminent importance to the entire history of the Fatherland!” One can only imagine the effect such a statement must have had on the formation of such a young mind. 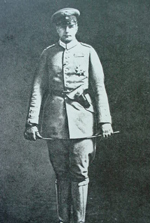 Thomas Wittmann in his book Collecting the Edged Weapons of Imperial Germany Volume One is to be credited with some of this information. Wittmann also said of the Prince that when Adalbert was an unmarried officer he traveled extensively throughout the world on German war ships as well as on the Royal Yacht “Hohenzollern.” It is said that the Prince was rather a rake with the ladies in his seafaring days, but please understand this activity was absolutely not approved nor condoned by the Kaiser or the royal house of Hohenzollern! Later when his earlier passions cooled, he married Princess Adelaide and he became a Korvetten Kapitan and was the Commander of His majesty’s ship, the Dresden, at war’s end in 1918. 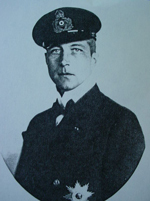 At one point in his naval career, he led a German Naval Marine landing party in heavy hand-to-hand combat action, thus he won the Iron Cross. 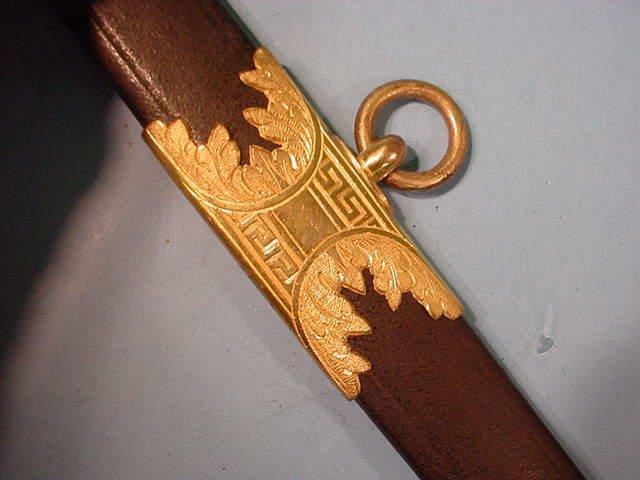 This was worn by him at all times after it was ceremoniously awarded personally by his father along with an impressive scattering of Royal orders that he received from many of the countries allied with Germany. We counted 20 to include of course the Prussian Black Eagle, Red Eagle, House Order of Hohenzollern and Order of the Prussian Crown. 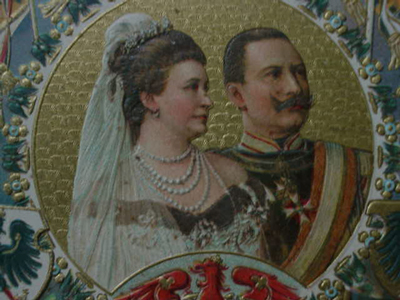 Besides these he received the highest decorations of Italy, Netherlands, Austria-Hungary, Portugal, Romania, Imperial Russia, Turkey, Zanzibar, etc. 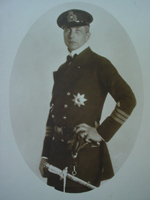 He was a genuine hero and probably the noblest son of the German Hohenzollern Dynasty. 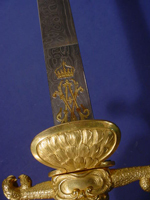 The Prince’s Falconry dagger: We have said previously that the Empress favored Prince Adalbert as the dearest of all her children. 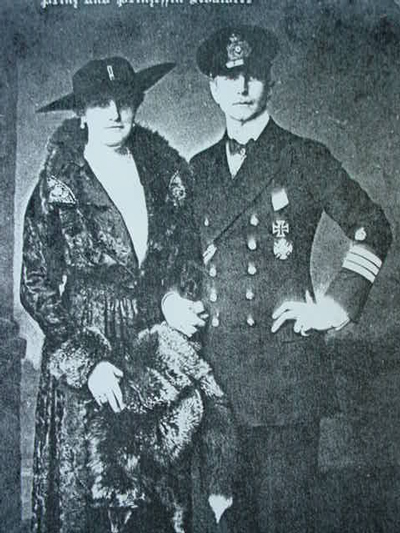 Not to say that she didn’t love each and every one of them individually but Adalbert possessed the distinct possibility that his ecstatic love of the sea and his great fervent ambition to be a naval officer that was always first and foremost in his young mind, somewhat advanced him in the great favor of his mother. 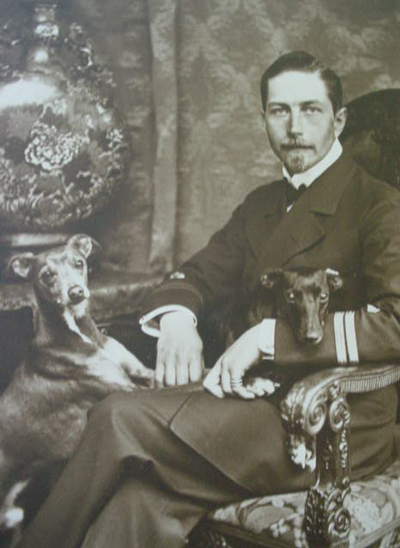 The Kaiser rather favored the Crown Prince Wilhelm, his namesake and heir to the throne, but he lavished attention all over his young sailor son as well. 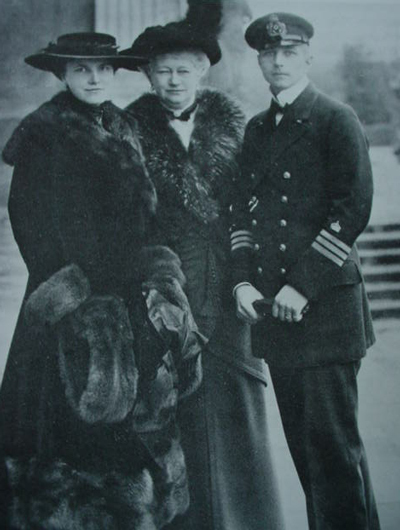 The Prince yearned to gain this nautical dream of his so adamantly that both mother and father thought him to be the most ambitious and dedicated of all their sons. His impassioned aspiration was most genuine and this young lad was admired by all in the Imperial court who knew him. 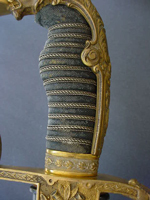 Thus when the Kaiser gave him the fantastic naval dagger, the Empress was so impressed having seen the great joy it brought to the prince she immediately decided she would also present him a dagger that would have appeal to him as a royal Hohenzolleren prince! When Adalbert was still a child it was toy ships, toy sailors, that were his favorite playthings and he had his personal pond on the Imperial palace grounds where he could sail his tiny ships. But his greatest prizes later as an adult were these daggers presented by his loving parents to celebrate his reaching his ever present dream. 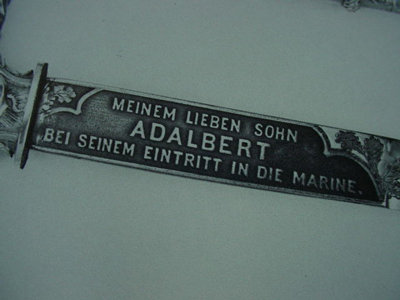 Adalbert was a noble seaman and a true gentleman. However, his one vice seems to have been his consistent seeking of rather amorous adventures in his various travels even though these were before his marriage. Eventually there were more amorous conquests; unfortunately for him the word got back to Papa. We are all unfortunately subject to human frailties! *Authors note! His father we know was a very strict religious Lutheran adherent and a very strict authoritarian and he insisted that his sons “tow the mark”! Discipline and order were implemented in them from an early age and he expected that this rigid discipline would continue to be observed throughout their entire lives. 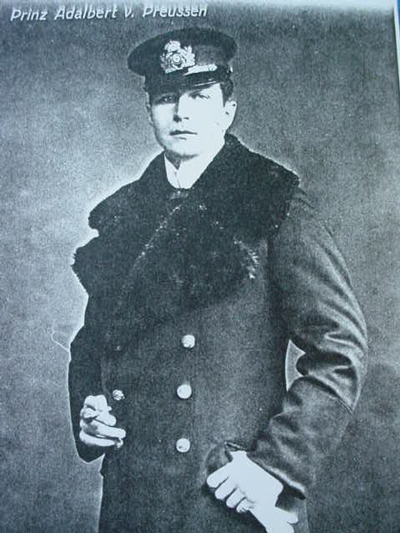 Adalbert, however, was the only sailor in the family and maybe the lust of those who “go down to the sea in ships” was acquired in his many cruises to foreign lands. He was handsome, rich, regal, and important and the girls flocked to him like the mermaids of the deep flocked to Poseidon! Unfortunately, this led to his downfall not so different than if he had been shipwrecked by the beckoned call of the beautiful siren known as the Lorelei of the Rhine! Today we look at this as rather risqué but forgivable, after all it was just a young man sewing his oats! But at the Royal Hohenzollern palace in Berlin, this turned out to be a scandal of gigantic proportion! 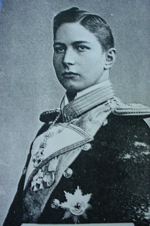 When news of his more infamous intimate escapades got back to the Kaiser even while the war was raging, the Emperor was livid and Prince Adalbert was banished from the Palace. 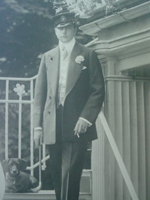 He never saw his father again, and the only one contact (a sad one) was when he came to Haus Doorn in Holland where the Kaiser who was exiled there in 1918 died June 4, 1941. 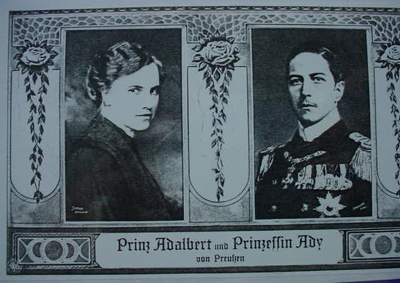 The Prince arrived there and we are told he did not speak to his brothers and sister but simply went to the bed that the Kaiser died upon (then empty) and placed a single red rose upon the pillow with a note that said: “Gott Segnen Meinen Vater Das Kaiser- Sein Sohn Adalbert.”(“God bless my father the Kaiser - His son Adalbert”). After this he turned and immediately left and did not visit the Bier of his father. Before this he actually sold his entire estate, his house, his other possessions, his medals, his naval uniform, and obviously this included the two beloved daggers and several swords. He then moved to Switzerland where he lived in seclusion for many years. 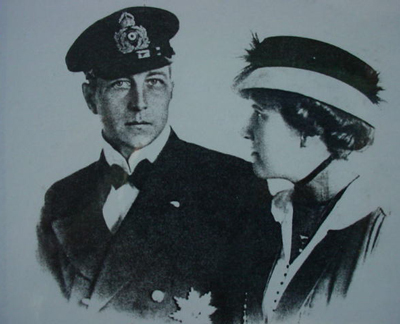 The Prince died in the Swiss Canton of La Tour de Peilz on 22 September 1948. 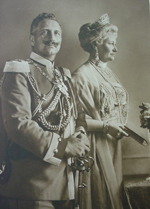 His wife, Adi, lived until 1971 and while she had always hoped a spirit of forgiveness would be forthcoming from the German Emperor during her husband’s lifetime but it was simply not to be. 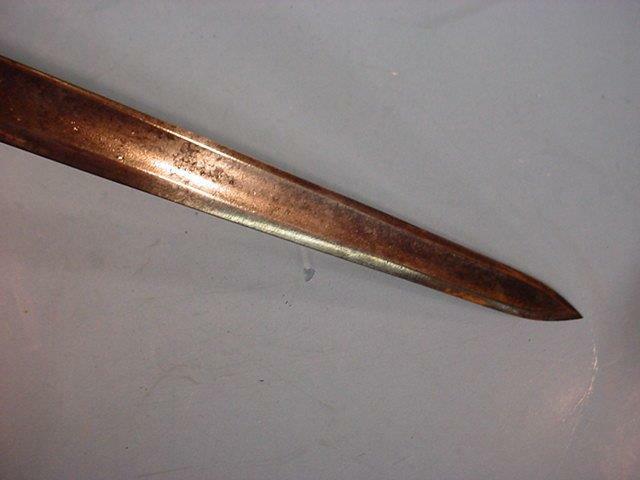 How the daggers finally came to the U.S. is still a mystery to us. The naval dagger has a fascinating post-war history to it but the fascinating story is just too lengthy for us to unravel here, but it involved the grandson of Prince Adalbert who unfortunately is not particularly a credit to the family name. 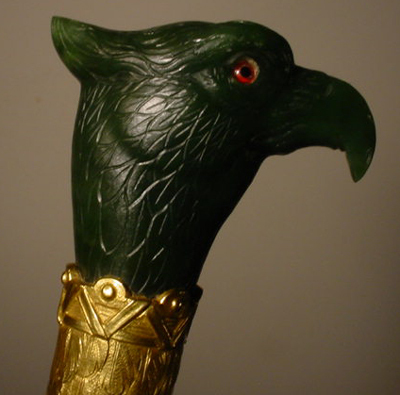 It involves one of our chief historical advisors in an intriguing adventure 25 years ago who by the way was one of the last custodians of both daggers. It is a story of international intrigue, attempted fraud on the part of “sub-royalty” and rather high adventure that must be reveled someday. 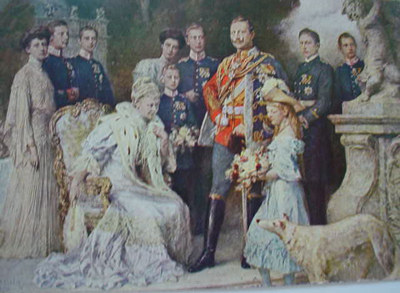 We have the highest respect and regard for the memory of Prince Adalbert and his Hohenzollern family but in my estimation he was not really the black sheep of the dynasty -- it was much later that a said to be royal personage entered the picture who still carries the family name (a fascinating story that will be tabled for now!). 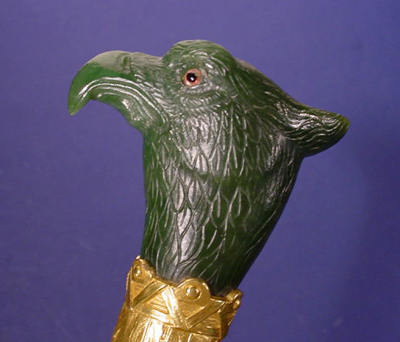 The Royal Falconry Dagger of Prince Adelbert: It should first be noted that the dagger has a pommel that has the carved head of a hunting falcon that is fashioned in genuine green jade. 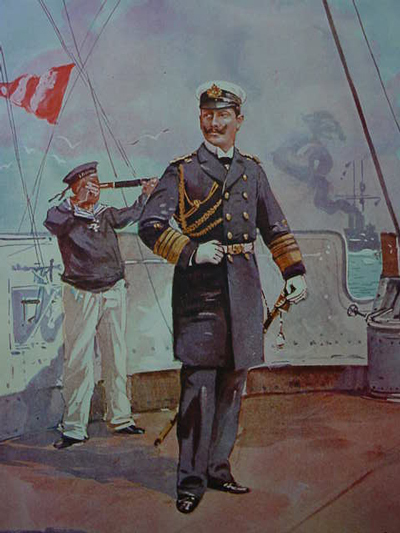 Now as we have noted that our Prince Adalbert was named after the great Prince Adalbert who was the Supreme Commander of the Prussian Navy in the 1850’s and the young son of the Kaiser attempted to emulate this eminent naval hero in every way he could. In 20 July 1853 the naval commander Prince Heinrich Adelbert worked diligently to bring about a superior German navy and he arranged for the hand-over of 340 hectares of Oldenburg territory at what is now Wilhelmshaven to the Kingdom of Prussia. This is in the eastern shore of the “Jade” estuary east of Bremerhaven; it was considered the best natural deep water port in the German North Sea coast and a good place for the naval base Prussia wished to build. The “jade bay” area offered deep water, a good base and anchorage and no ice in the winter. 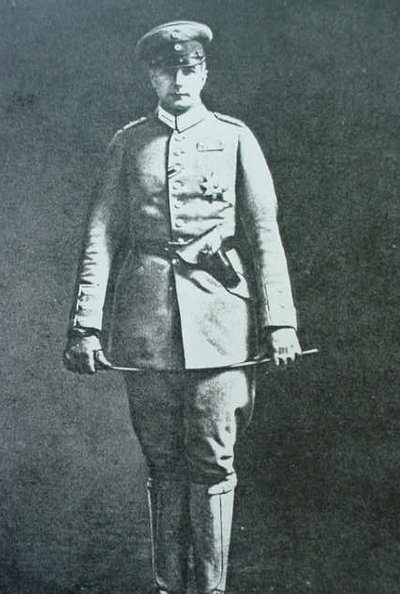 Oldenburg welcomed the idea of Prussia as a powerful ally. This was a major event that went far in securing practically the entire North Sea coast for German shipping and harbors for war ships. 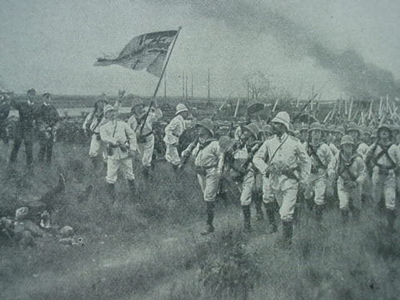 It was an event celebrated by the Prussian people as a major event in their history. We do not know how the estuary received this name but the spelling of jade is the same in English as it is in German and it refers to a metamorphic rock that is found mostly in the Orient and is considered a sacred stone in China. It is a gemstone of unique symbolic energy and also unique in the myths that surround it. With its beauty and wide ranging expressiveness, jade has held a special attraction for mankind for thousands of years. 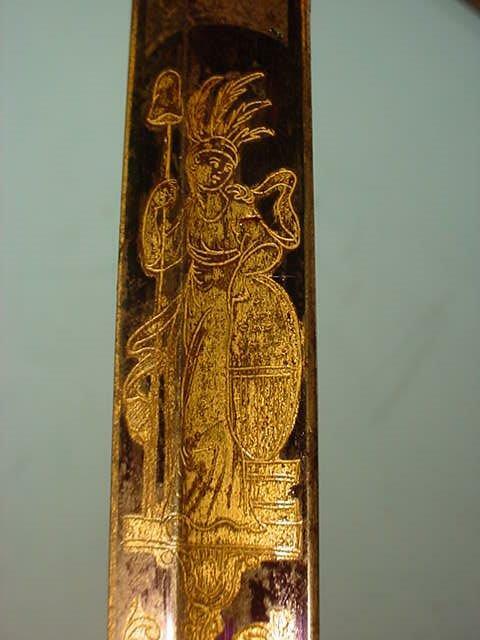 The other place where fine jade was found and revered was in the South American Amazon region with the Pre-Columbian people of the Mesoamerica regions and especially among the Mayan people , the “Ya’ax” chick or Jade meant life, fertility and power; it was considered greater and more valuable than gold. Could the fact that the royal mother chose to have the pommel decorated with jade have any connection with the first Prince Adalbert's accomplishments in securing this exceedingly important acquisition for Germany? Did the name of the Jade estuary influence her artistic and historical thinking and final decision in design? 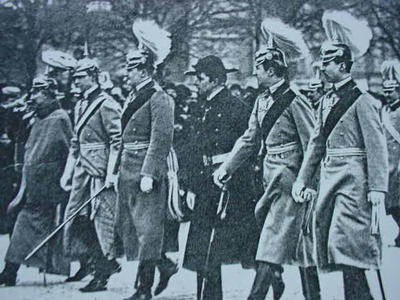 Always remember that “tradition” has been ever sacrosanct in the hearts of Imperial German rulers. Now, like his namesake, the young Price Adalbert was a world traveler vising many countries. One of the most noteworthy voyages made by the earlier Prince Adalbert was his expedition up the Amazon River and the Xingu in 1849. It is said that when he returned from this intriguing journey he brought many souvenirs and important relics home with him to include some examples of Brazilian jade carved by the ancient Mayas. Also, he brought some perfect examples of uncut jade. It does not take much speculation or extrapolation to figure out who might have acquired some of these treasures. His most ardent admirer, the young son of the Kaiser, Prince Adelbert was elated to finally receive these gifts that had belonged to his illustrious relative. 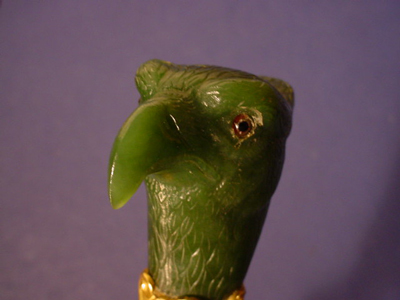 It is also not difficult to imagine that the Prince bequeathed a spectacular piece of this jade down through the family and that it very well could have eventually became the property of Kaiser Wilhelm II and the Empress Auguste Victoria who no doubt turned it over to an extremely talented carver who fashioned the Falcon's head to be the crowning finial to the fantastic dagger. 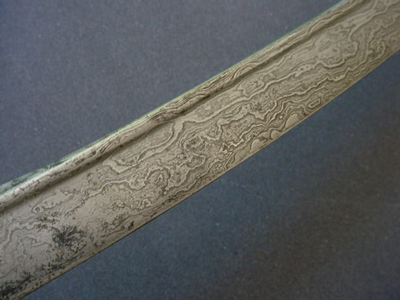 Yes, this theory is extrapolation from several sources but we believe it is logical for we know that in our cumulative historical knowledge amassed over periods of many long years in pursuit of such items and learning about them we can say that we know of absolutely no instance other than this one where jade was utilized in the construction of a German edged weapon. This piece is unambiguously and consummately unique and unprecedented in the history of edged weaponry. It emblematizes Royalty like no other edged weapon that we have ever heard of. It actually seems to emit power, majesty, Imperial dynamism and seeming omnipotence. To hold it in one’s hand brings about in the mind of true Germanophiles an extrasensory perception, a distinct feeling and sensation born of passion for the aesthetically beautiful and the profoundly important. But what would George Bush or Al Frankin get out of holding it? (Answer- Nothing!) The dagger with the Falcon's head pommel has glass eyes and a very pronounced beak and has gorgeous carved feathering throughout. 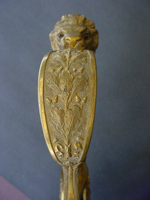 The gilt bronze feathered grip works down to the cross guard that has the claws open to clutch the prey! The very pronounced clam shell also has fine simulated feathering. 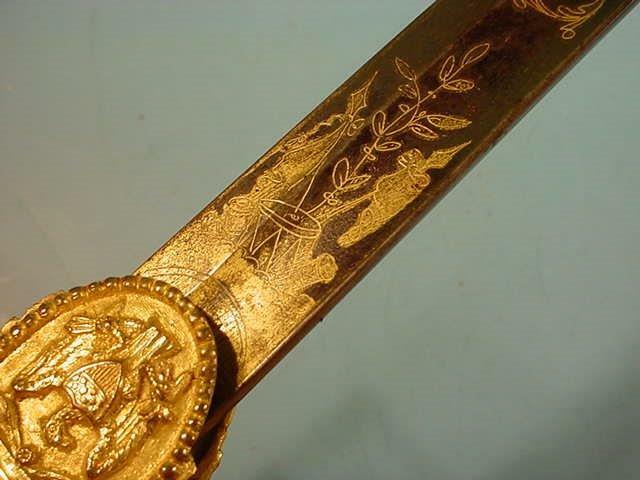 The blade measures 13-1/16" in length with the monogram set in gold that depicts the Crown of the Kaiserin and that is centered over the cyphers (AV) Auguste Victoria and on the reverse side is the (A) for Adalbert under a typical Prussian Princes crown also set in gold lettering. 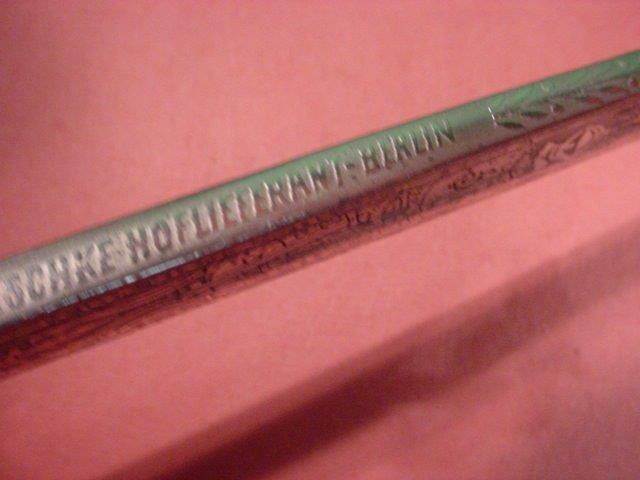 The spine is marked M. Neumann Hoflieferant-Berlin. 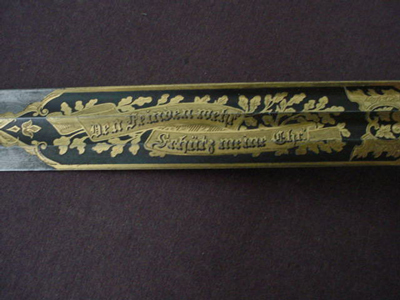 The word Hoflieferant means that Herr Neumann was a maker to the royal palace or Hof. 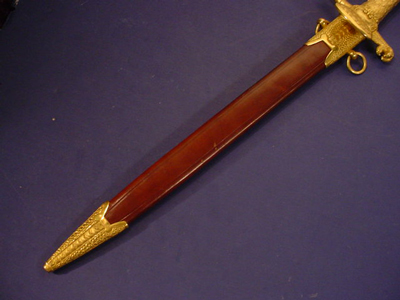 The scabbard is in high quality brown leather with a gold bronze two ring throat with an engraved mosaic like pattern and matching boot (or tip). 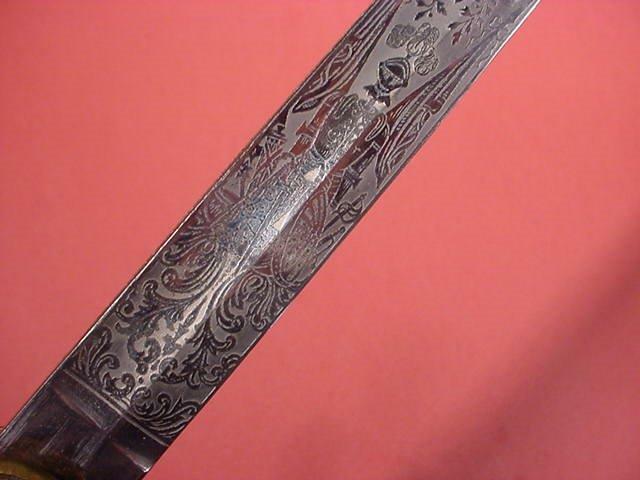 The entire dagger is in excellent plus condition including the fabulous Damascus blade that is an example of the ultimate in German Damascus mastery. 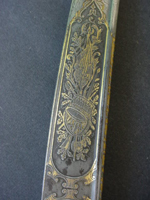 The dagger was certainly a regal gift by an adoring Mother but what of its general usage? 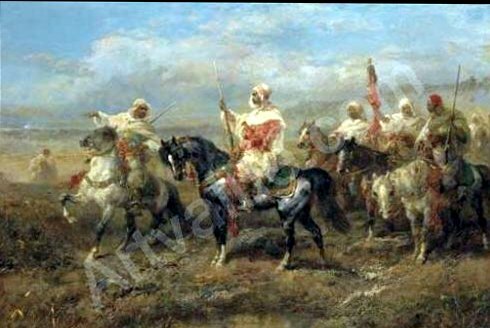 Falconry was practiced and enjoyed by the European nobility for centuries but especially and notably in Germany. We know that Prince Adalbert was an aficionado extraordinaire in this the sport of kings. When he was not sailing he was the ultimate falconer! 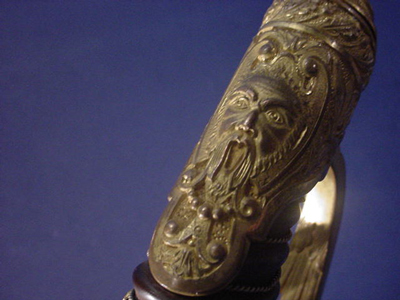 The dagger certainly does take on the outward appearance of a medieval falconer’s weapon as seen in museums in Europe. 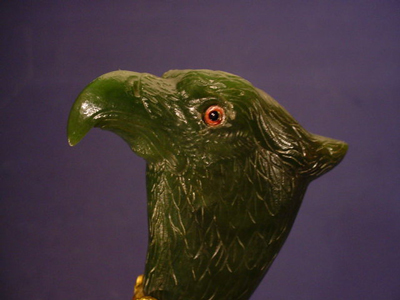 This without a doubt would have been the ultimate gift to this young practitioner of falconry. 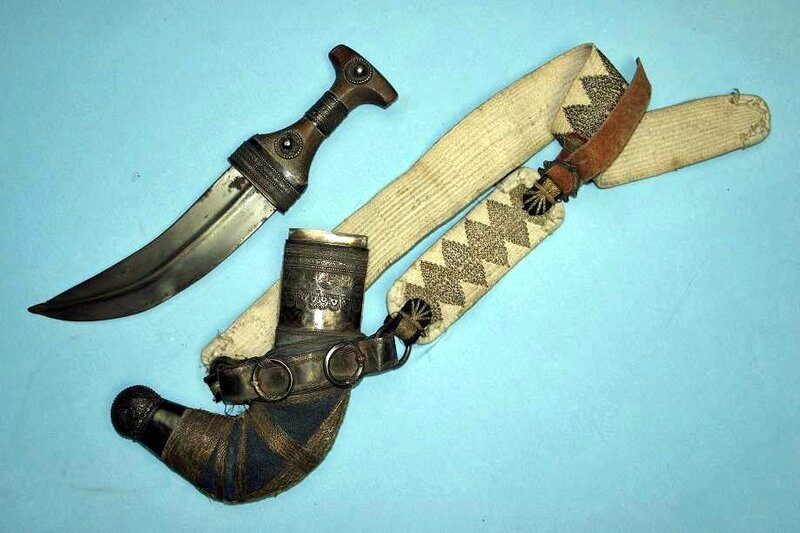 Certainly the dagger had no actual utilitarian use but was proudly worn as a resplendent part of the outfit that was donned when the Prussian Prince would be indulging in this his favorite pastime. 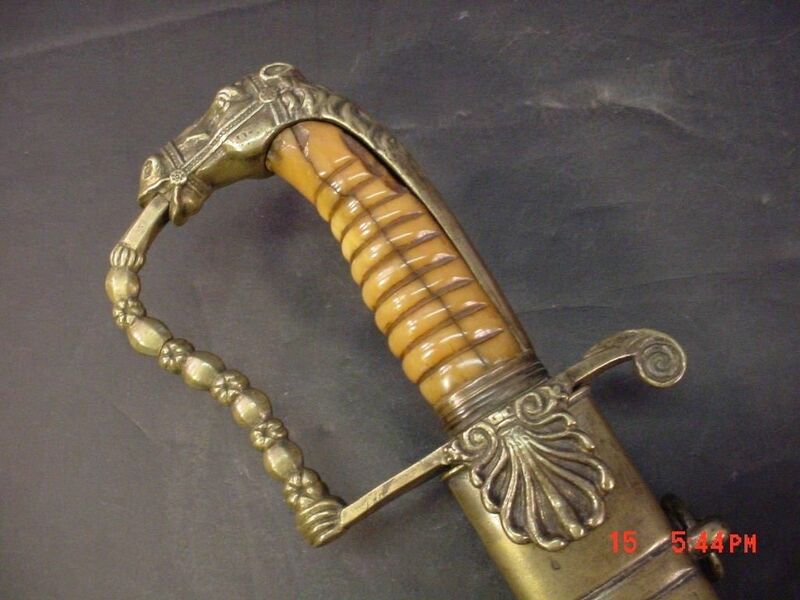 So in closing this narrative, the longest description we have ever given on any dagger or sword, we can only say we are practically euphoric to be privileged to handle this awesome and priceless relic of the history of the age of great opulence, refinement, pomp, glory and high adventure! 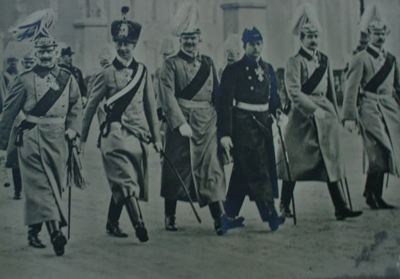 However we now have to sadly say that the days of the proud and glorious Hohenzollern regime are now past tense never to return! If any priceless relic would unequivocally summon up memories of that eloquent era of Teutonic Imperial glory and splendor it would have to be this dagger since we don’t have the Royal Prussian Hohenzollern crown to offer. When I view this magnificent relic, I am reminded of the wonderful book by author Margaret Mitchell about the fall of the noble Antebellum South and the subsequent film that evolved. The quote was: “Look for it only in books for it is no more than a dream remembered. A civilization GONE WITH THE WIND”!